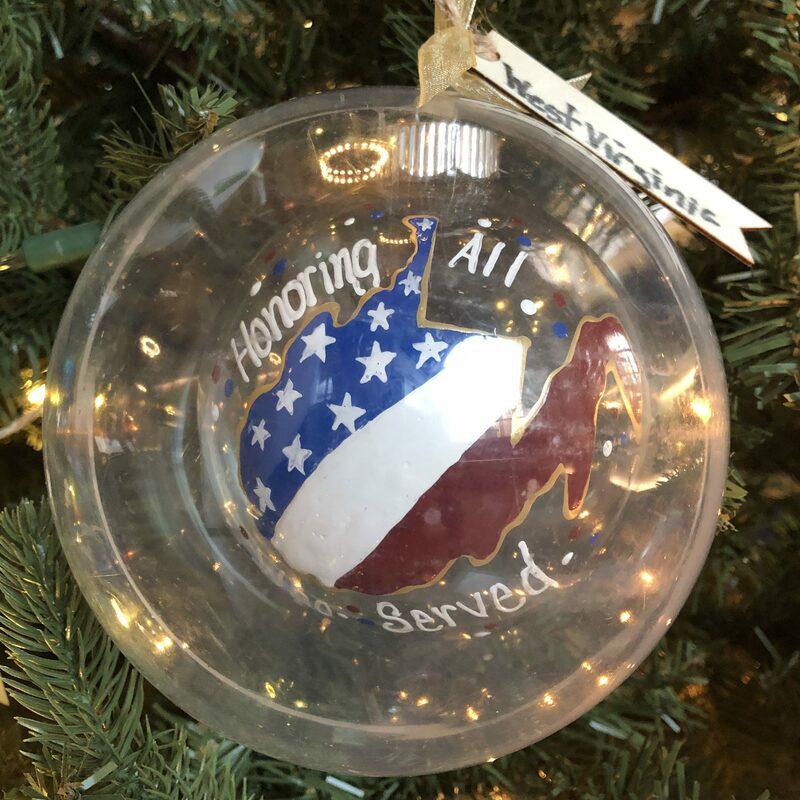 Every year one-of-a-kind ornaments are made by ordinary Americans, representing every U.S. state, territory and the District of Columbia. 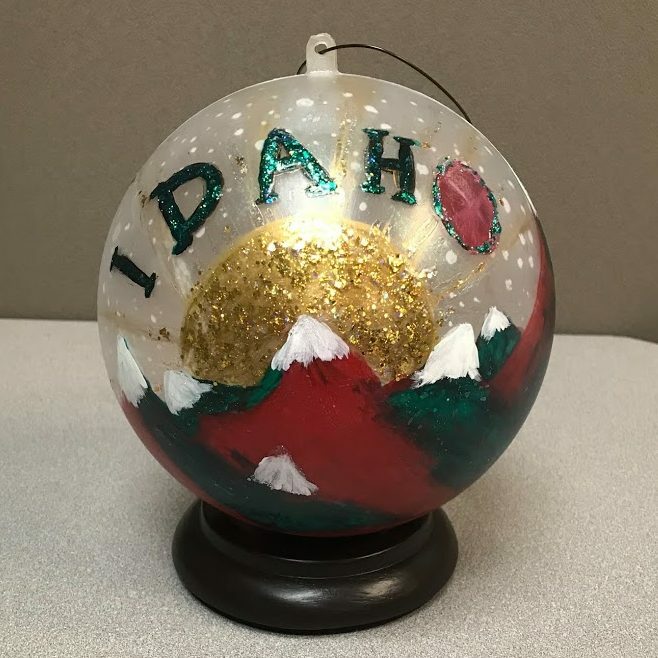 These artists give their time and talents to design and create ornaments that symbolize the history, heritage and culture of their homelands. The America Celebrates display, which surrounds the National Christmas Tree, is free and open to visitors throughout the month. Hewitt-Trussville Middle School – Hello from Trussville, a nice city near Birmingham. We are the Hewitt Huskies and this is our 8th-grade Art II class. We are honored to decorate ornaments representing our state. On our ornaments, we painted our state flower and bird, the camellia and yellowhammer. We painted the shape of Alabama, a city skyline, a forest, Christmas lights, Santa Claus, and the statue of Vulcan on Red Mountain. We painted snowflakes and snowmen because any snow here is a special occasion! We learned a lot from this project: gluing, priming, painting, and sealing the ornaments. We hope you like them! 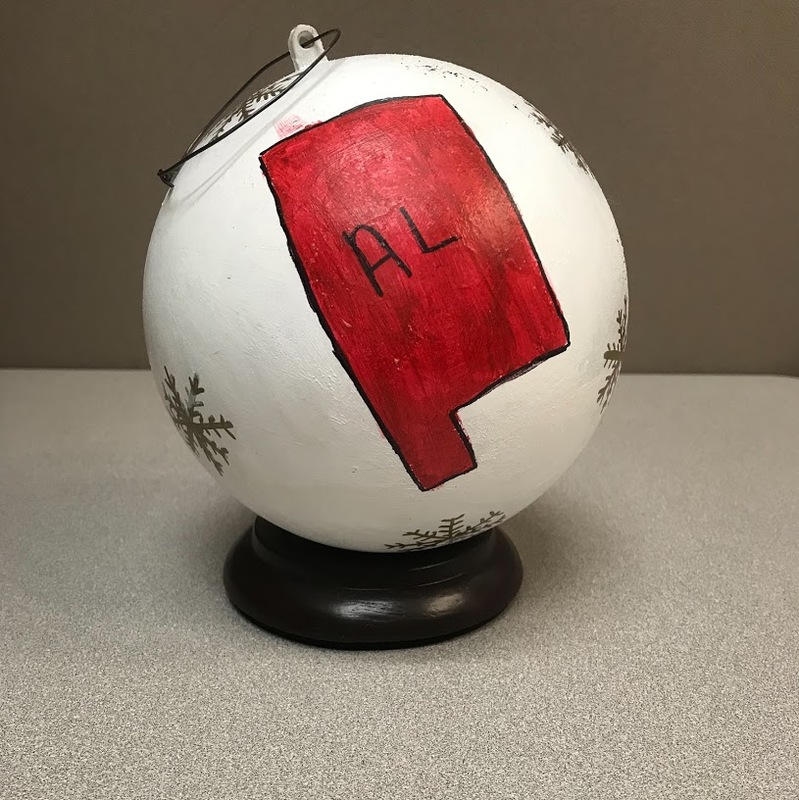 Ardis Ann Middle School – Our ornament designs originated from research about state symbols for Arkansas. Symbols represented are state insect (honeybee), state bird (mockingbird), state flower (apple blossom), state mammal (white tailed deer), state drink (milk), state butterfly (Diana Fritillary), state gem (diamond), state nut (pecan), state mineral (quartz), state vegetable/fruit (tomato), as well as the state dinosaur and images of the state shape and scenery around the region. 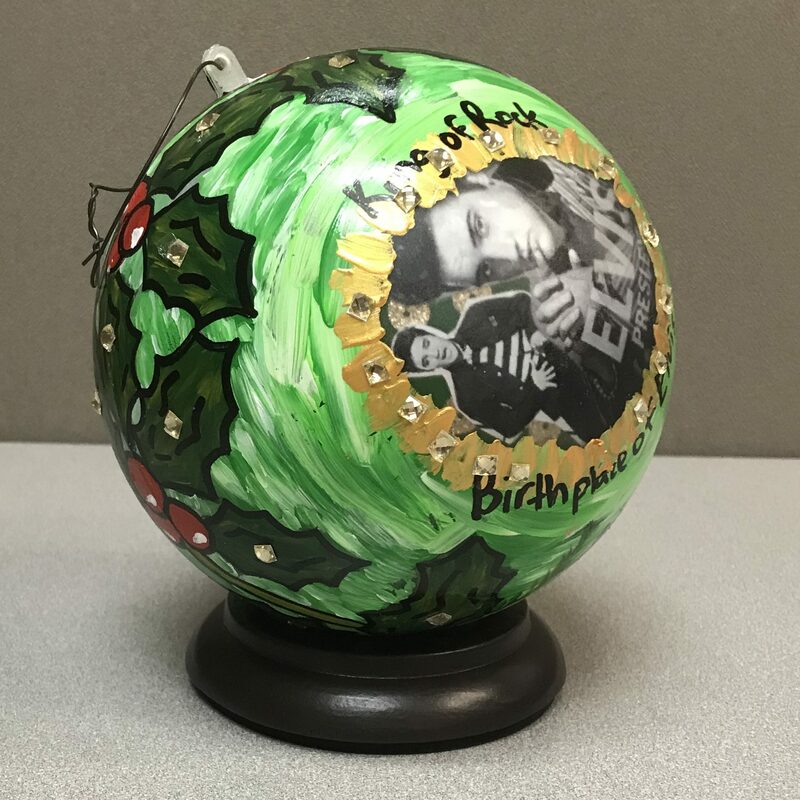 Ornaments were completed with acrylic paint, collage, and paint markers by 6th grade students from Ardis Ann Middle School in Bentonville, Arkansas. Dover Air Force Base Middle School – (Fold. Crease. Set the Fold. Angles transformed by fingers … Nimble, but precise.) (Humble structure of thirty precision units. 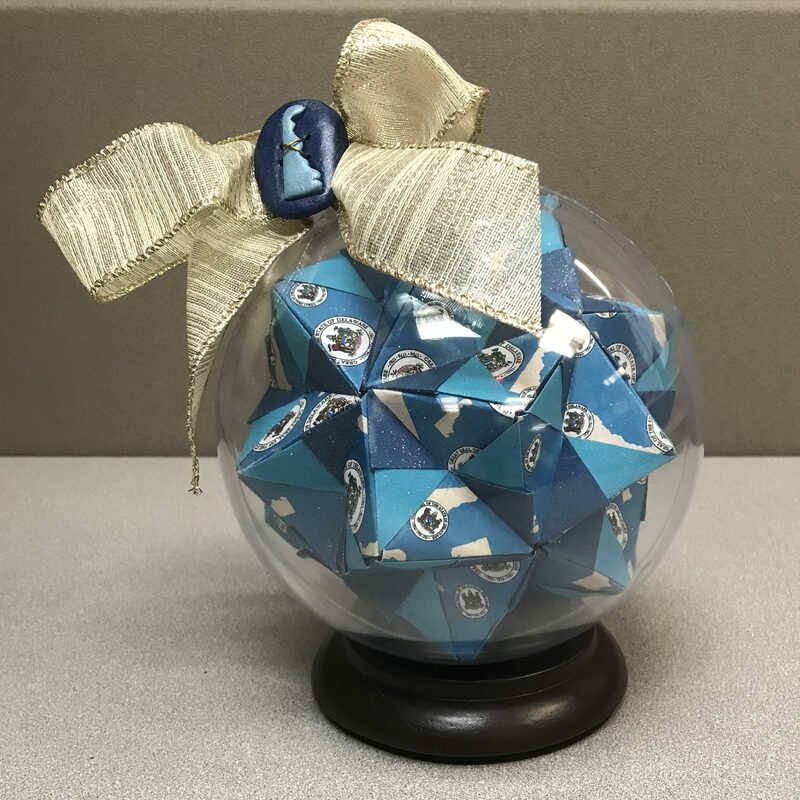 Icosahedron.) (Japanese tribute … Adorned with color and folds. Reflects Delaware.) Under the supervision of Visual Arts teacher, Mrs. Amy Laslow, this haiku poetry describes her students’ delicate, origami orbs that emerge from a marriage of Mathematics and Visual Arts. Designed to enhance their understanding of geometry and coupled with the historical significance of this traditional Japanese art, the Pieces and Creases Unit allows her students to explore the world of sculpture through the manipulation of a single sheet of paper. Agueda I. Johnston Middle School – Under the supervision and guidance of art teacher Gloria Obias, these hand-painted ornaments were created by AIJMS students. Inspirations range from local symbolic imagery that includes landmarks, legends, flora and fauna. 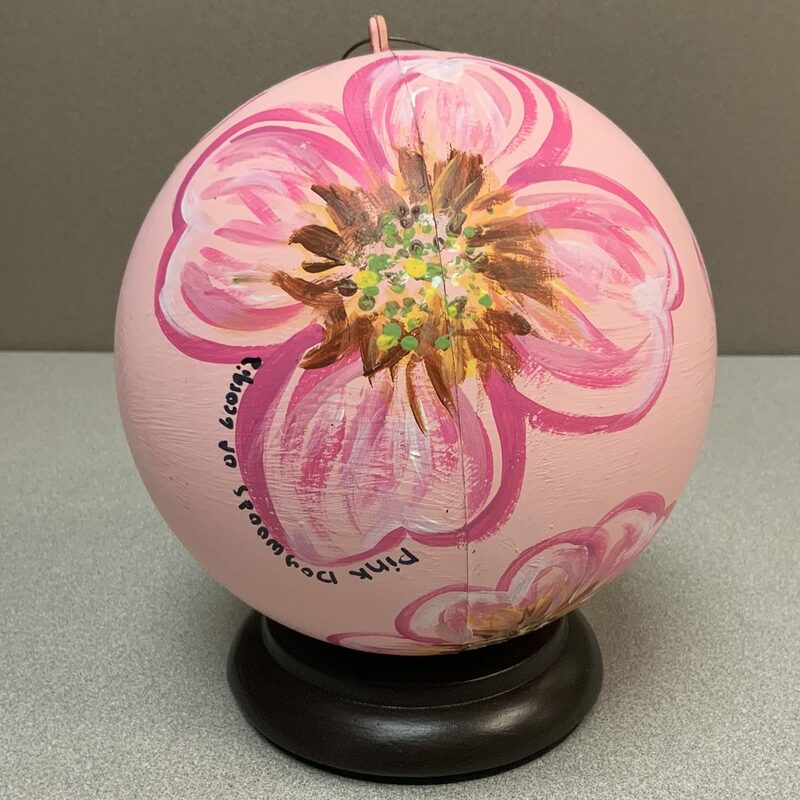 Students used acrylic paint to showcase their designs on their globes. Our Lady of Grace Catholic School – Our Lady of Grace is a 2018 Science, Technology, Engineering, Mathematics (STEM) certified school in Noblesville, Indiana. We are the first Catholic school in the state, and the first preschool through 8th grade school to be certified STEM in Hamilton County. 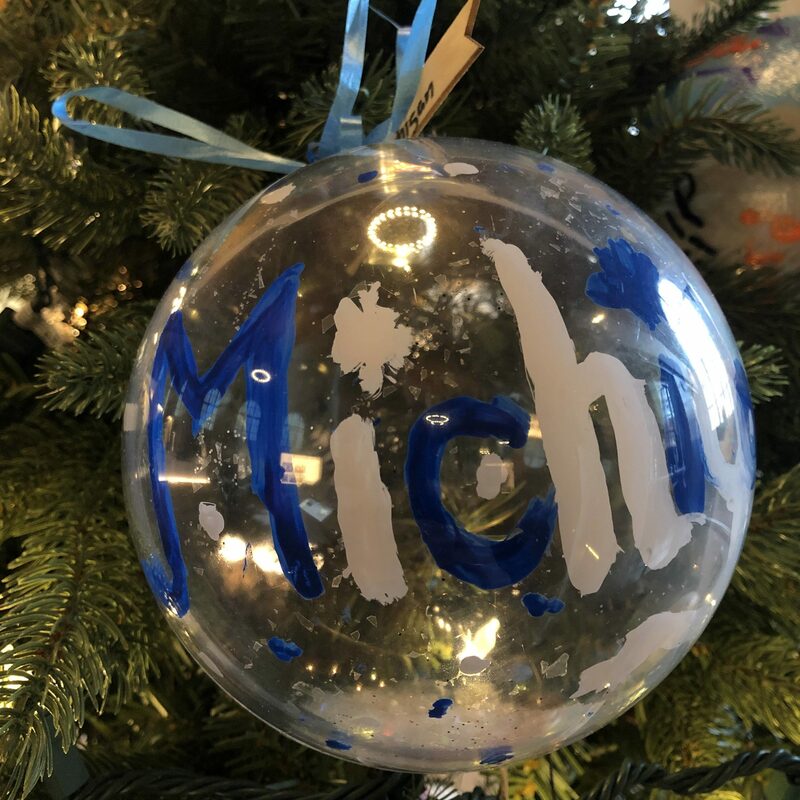 A group of middle grade students at Our Lady of Grace Catholic School used a variety of designs, techniques, and materials to create our ornaments. 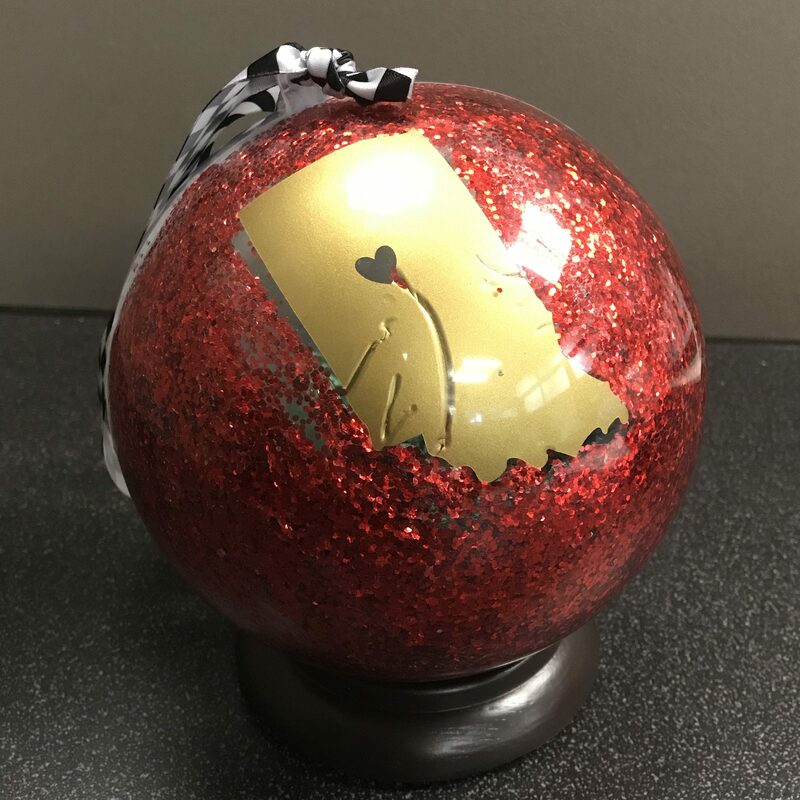 One of the biggest events in Indiana each year is the Indianapolis 500, so we chose a racing theme for our ornaments. 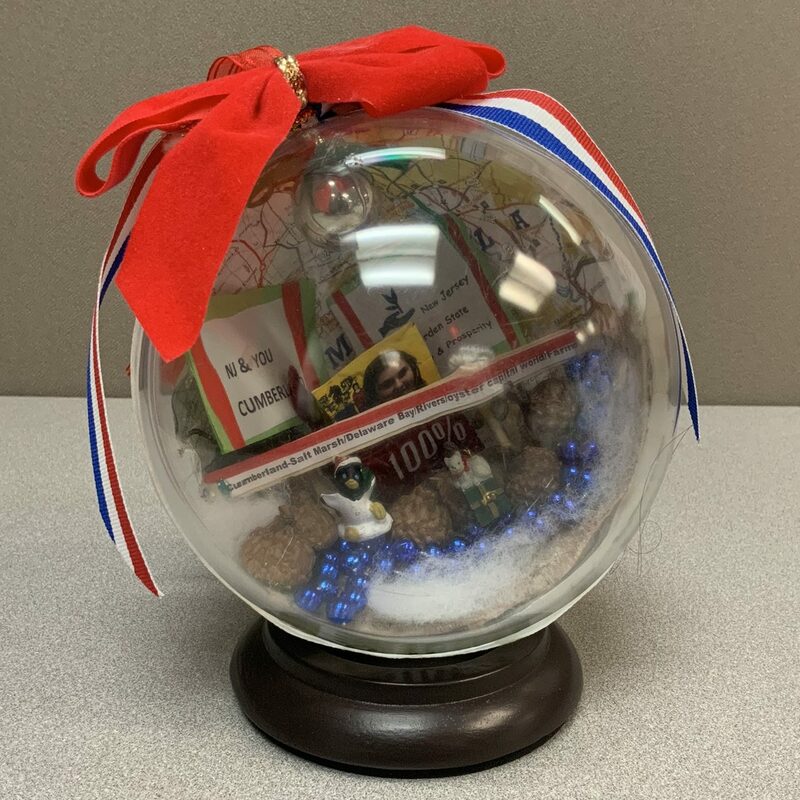 Our students designed a car to be made on our 3D printer, hand-painted flags, other Indy car logos on the globes, and engineered Indiana stickers printed on a vinyl to represent our state. We are honored to be a part of the National Christmas Tree Lighting of 2018 in Washington DC. Wossman High School – Louisiana is so very unique and rich in culture. 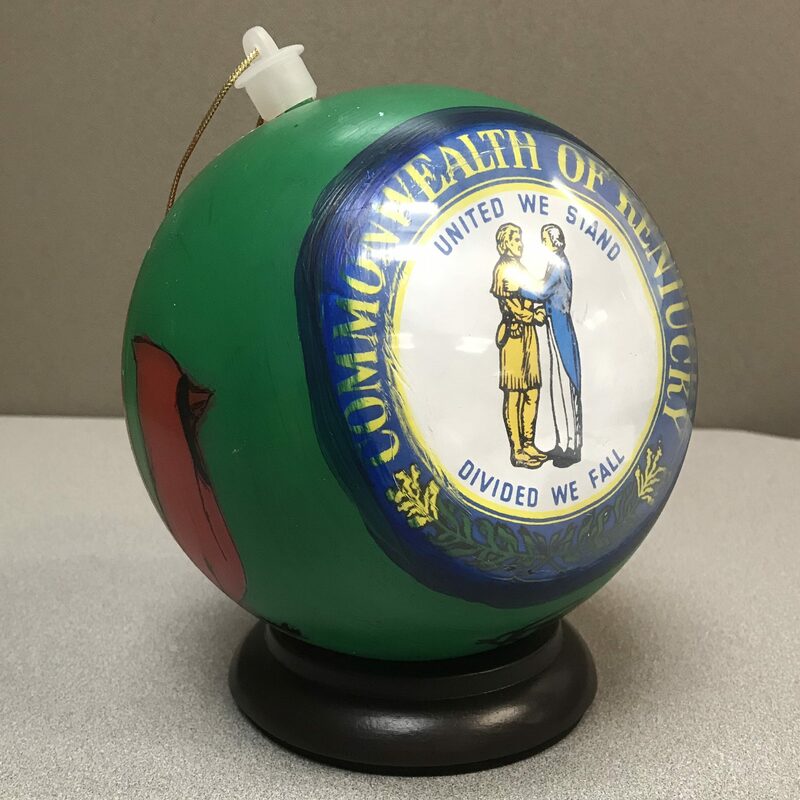 The ornaments represent a wide spectrum of what our state is all about ranging from education to our world famous cuisines. In addition, it is a representation of what we as Louisianians hold dear to our hearts and that is family and the enjoyment of the Holiday Season. 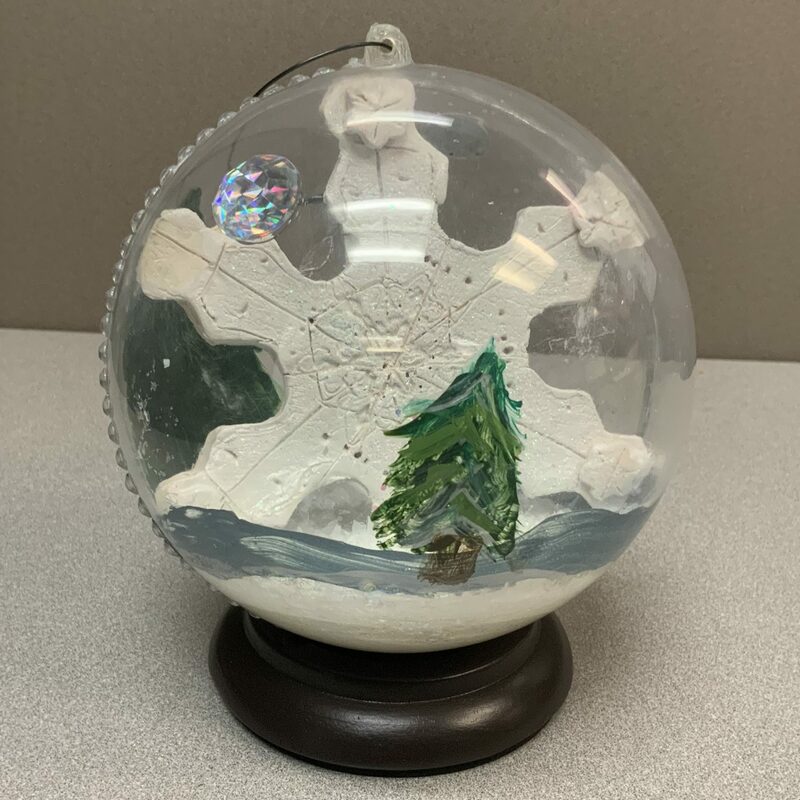 Carman-Ainsworth High School – Students of Carman-Ainsworth created ornaments that represented the essential aspects of our state: elements of nature, the four seasons, beautiful landmarks, and enjoyment. Visitors will see that there are decorations that focus on the beauty of our winter snow and ice,fresh water, and the color of the leaves changing in the fall. From football, to cars on the race track, to ice skating in Detroit in December, Michigan is a place that there is something for everyone to enjoy. Carman Ainsworth loves the uniqueness the diversity and beauty of Michigan. Roundup Jr.-Sr. High School – When the students at Roundup Jr. – Sr. High Schools were asked what they felt best represented Montana, the answers were as varied as our population, and as vast as our beautiful state. A student committee met and chose the 24 ideas that best exemplified life under the big sky. Simplicity was important, as we are not pretentious people, and soon the paper sculptures came to life. Cutting and assembling the ornaments was not easy, but the outcome was amazing. Our tiny community and school are proud to represent Montana, and give viewers a small taste of the last, best place. Ocean City High School – New Jersey & You! Our Garden State inspires us- Ocean City High School to remember all things are related-we are One in our Universe. 100% N.J. is a very exciting state! 21 counties with a vast amount of natural resources-waterfalls, estuaries, pine barrens, forest, sandy beaches, oceans, rivers, mountains & farmland. Each host a magnitude of wildlife- bringing joy to our hearts as we listen to the call of the wild upon our souls. What message would you like to convey to others about our environment?” How can you as an individual help walk the Pathway to Peace-protecting Our Earth? Beulah High School – North Dakota. Big, vast and beautiful. 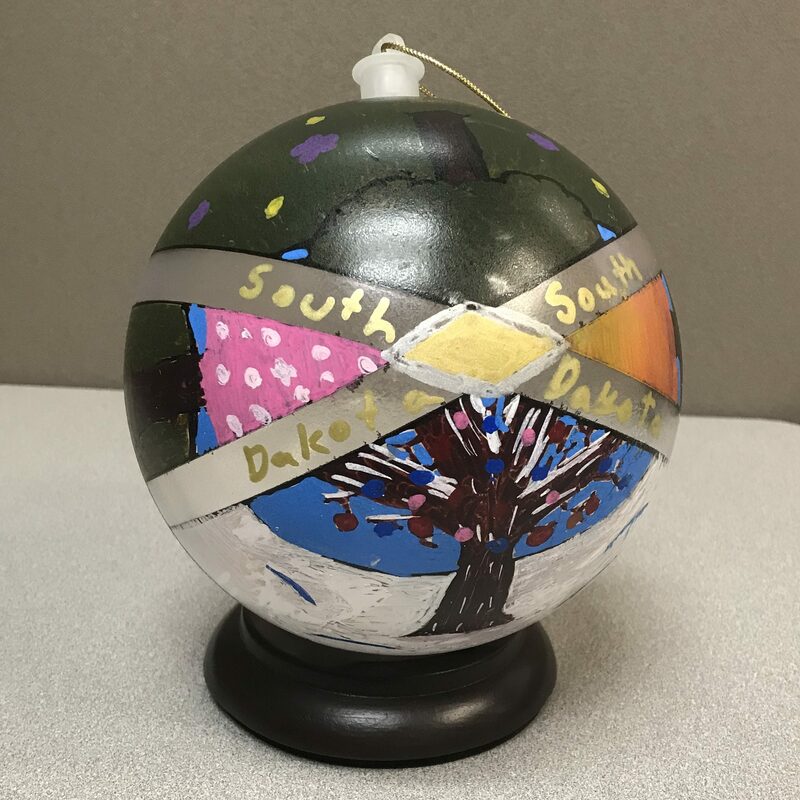 Beulah High School was inspired by our states sprawling land and variety of places to see in creating our ornaments. From the prairies, wheat fields, farms, lakes to the badlands. These locations became the theme for our ornaments. A mixture of twenty four seniors, juniors and sophomores worked on creating the ornaments. They used acrylic paint to create their designs and sealed them with an acrylic gloss medium. The seniors lead the charge with wanting to show the deep beauty found here in North Dakota by focusing on various landscapes found around our state. Howard St. Charter School – Howard Street Charter School provides an innovative public education balancing the “Three E’s”, Ellington (arts), Einstein (science and technology) and Esperanza (humanities and language). 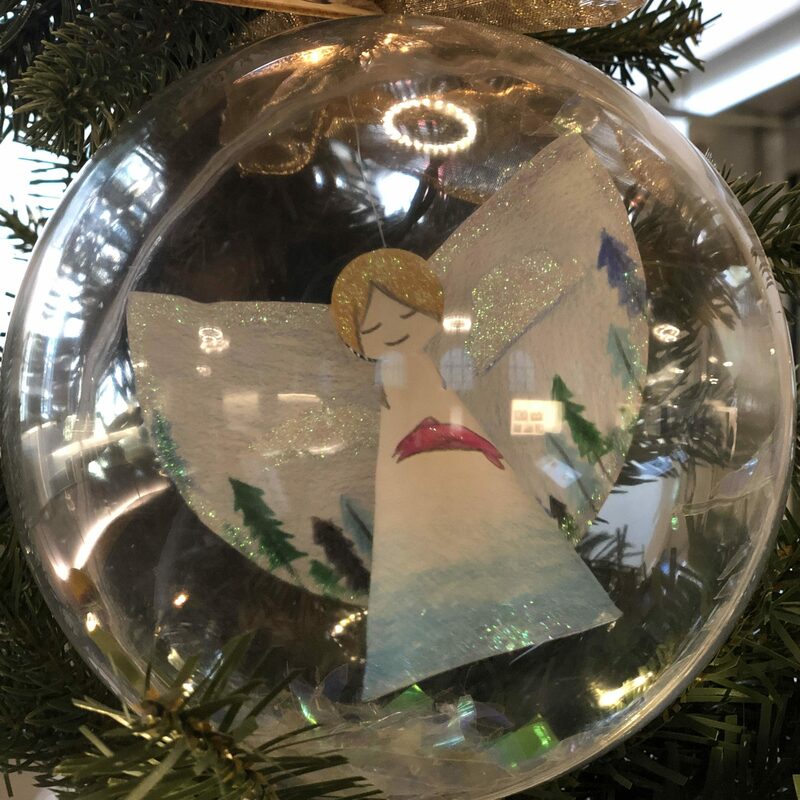 Our ornament shapes focused on Esperanza (which means hope) angels and peace doves. Students were asked to think about what they appreciated about our state and represent that on their ornament. Some students chose to represent the diverse Oregon landscape of the high deserts, mountain peaks, river valleys and/or coastal oceans. Other students chose to represent the flora and fauna of our state, and several focused on our ever changing weather. A selection of sixth, seventh and eighth grade students met after school to create the ornaments on watercolor paper using watercolor paint, ink and colored pencils. 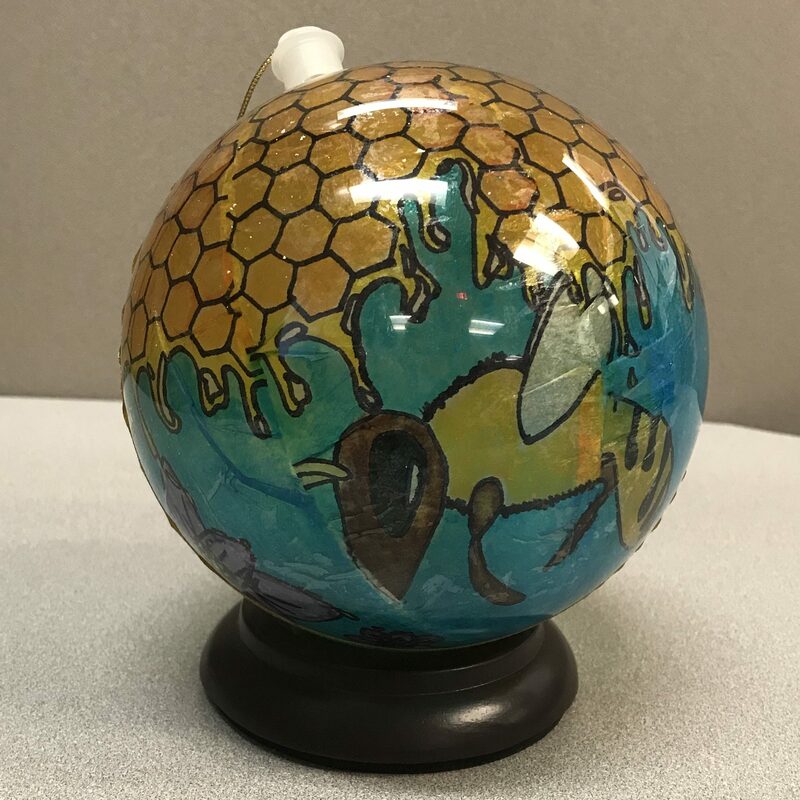 John W. Moore Intermediate School – South Carolina used the state symbols for our inspiration in the artwork of our ornaments. 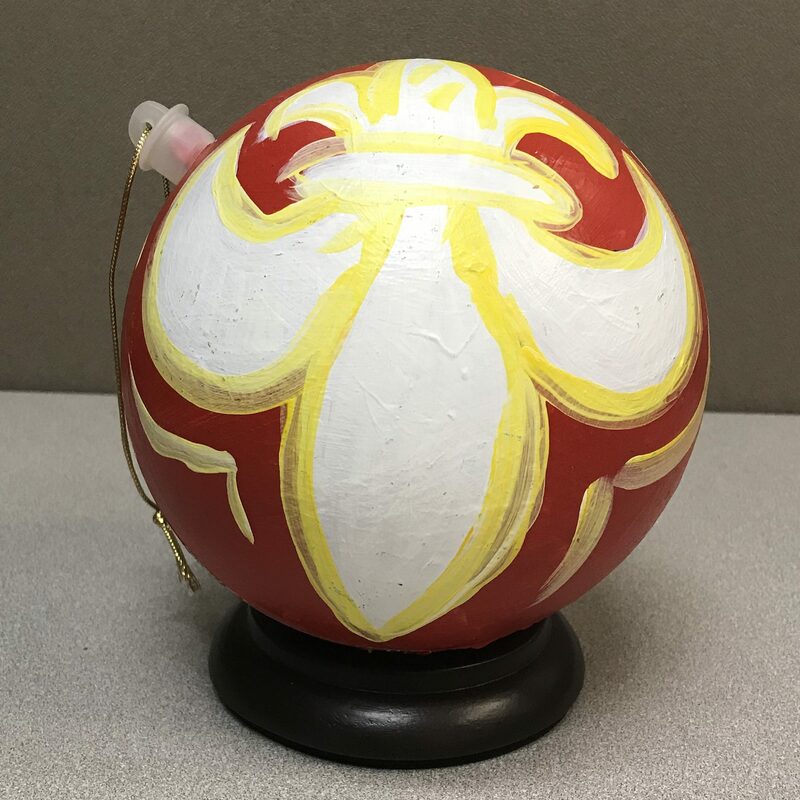 Students used acrylic paint on paper to create each symbol suspended from the top interior of the ornament. The overall design of the half blue globe and the lettering on the clear side was designed by the group collaborating on the unifying aspects of the design. Each symbol was identified on the interior of the globe with white lettering. The students wanted viewers to know about our state. One globe was dedicated to first responders who have given the ultimate sacrifice to our state. Evergreen Junior High School – The students who were involved in decorating the ornaments from Utah at Evergreen Junior High are members of Art Group, which is an after school program comprised of seventh, eighth, and ninth grade students who want to be involved in creating different art projects throughout the year. We worked with the theme of showing different symbols of Utah, using everything from iconic seagulls and bees, to aspen trees and elk… and even a Utah raptor. 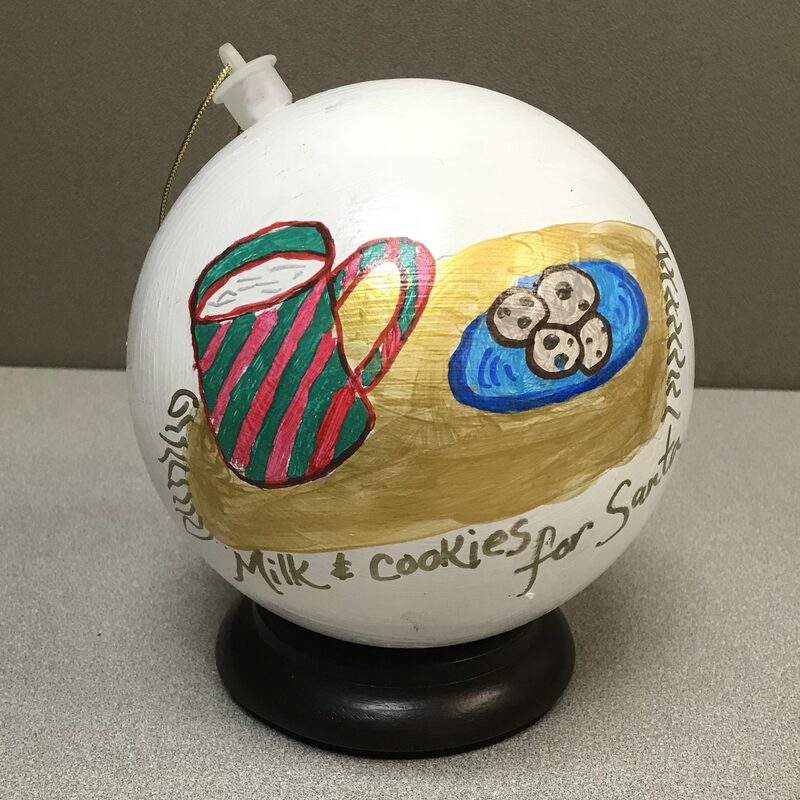 Students designed their ideas on paper, and then worked in acrylic paint on the ornaments themselves, painting either inside, or outside the ornament, or even both. Some students partnered up to do a single ornament, while others worked solo. All of them enjoyed it so much, and are loving all the attention and accolades they are receiving from our school and district. 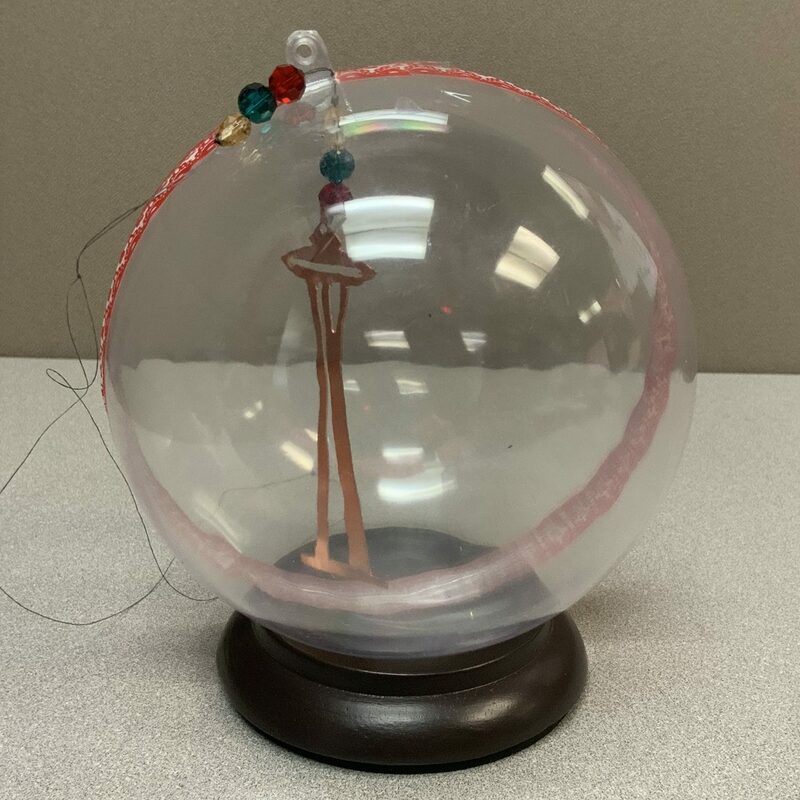 Graham-Kapowsin High School – Figuring out how to design ornaments using the large plastic globes proved to be a challenge for a jewelry class. We chose Mt. Rainier and the Space Needle as our theme. Both landmarks are strongly represented icons of the state. The Space Needle and Mt. Rainier were subjects that all of my students were familiar with, so they were easy for my students to visualize. I taught my beginning students basic sawing techniques, and my advanced students learned the more advanced technique of saw metal piercing. I wanted my students to be proud of this once in a lifetime accomplishment. Tanana Middle School – We had approximately 25 kids throughout the course of a week, involved in this fun project. We chose “Kings” as the subject because they are a tasty state resource. We used gold in the background, to reflect the mining of gold as another important resource. Our first step was cutting fish silhouettes. We used them as stencils for spray painting the colors of gold, red, and green. Next, we used permanent markers to draw the fish. We used tempera paint to fill in the colors of the salmon, as the final step. Gabrielino High School – Gabrielino High School is located in San Gabriel, California. 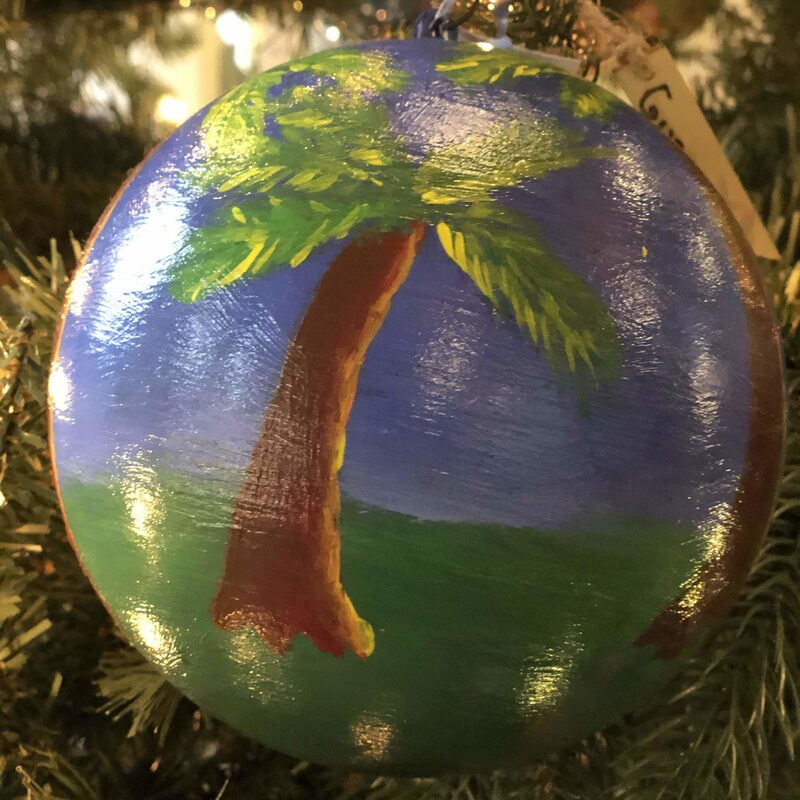 The art students of two separate Intermediate Drawing and Painting classes worked together to design tree ornaments that incorporated multiple themes commonly associated with California. The two classes used acrylic paints in a warm color palette of red, yellow, and gold to unify the overall look of our tree. These warm colors also address our common concern for the environment and for protecting California’s treasured wilderness. We are so proud to be part of the 27th Congressional District represented by Congresswoman Judy Chu. We would like to express our appreciation to her for all of her efforts to protect and preserve our local natural resources. SEED Public Charter School – The SEED School of Washington, D.C. is the nation’s first public, charter, college-preparatory boarding school. Our mission is to provide an outstanding, intensive educational program that prepares children, both academically and socially, for success in college and beyond. Kamala Subramanian, artist educator, has taught these talented scholars for13 years. 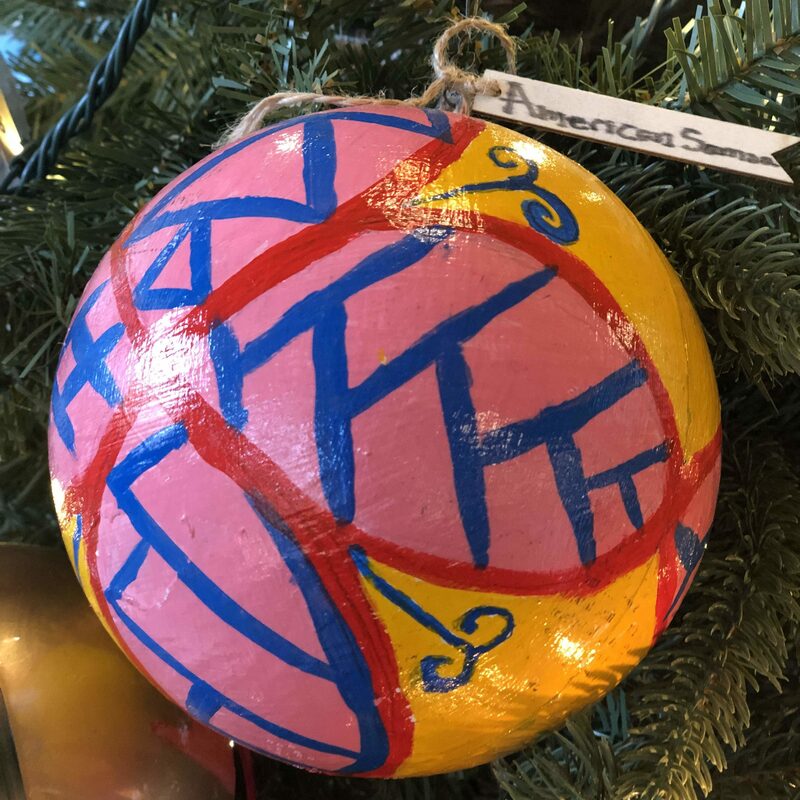 Our contributing scholars from grades 7 through 12 have created ornaments using a variety of art mediums and were inspired by everything in our Nation’s Capital from our 2018 Stanley Cup winning Washington Capitals to our world class Smithsonian museums, national zoo, national parks and artwork from the Washington Color School. 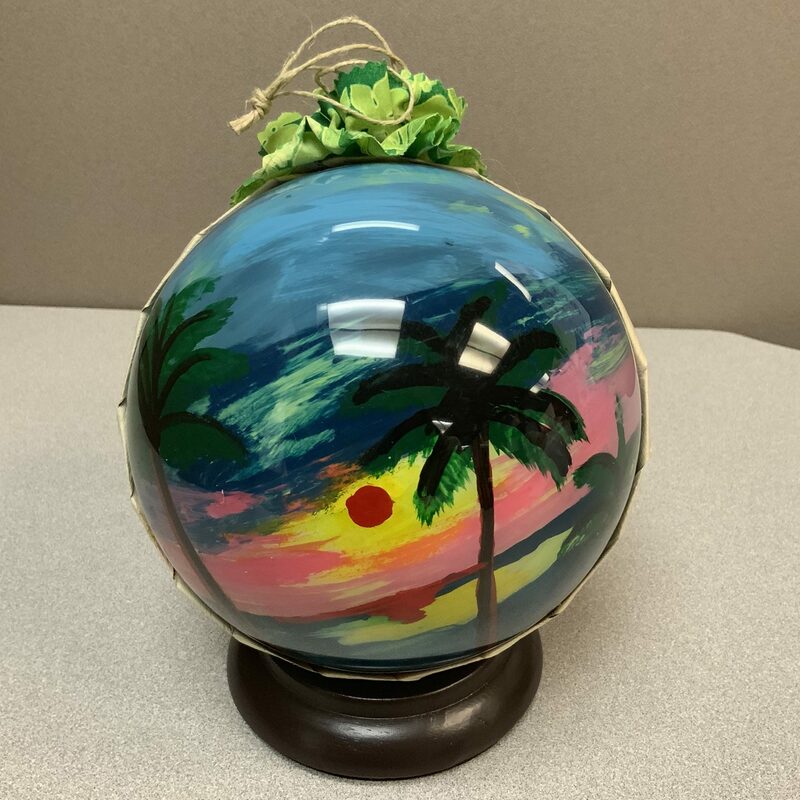 Robert Louis Stevenson Middle School – “Aloha from Hawai’i: Land and Sea” is a collection of hand painted ornaments from 18 seventh grade students in Exploratory Art, with the weaving and sewing help of two educational assistants, at Stevenson Middle School. Our school is nestled between Punchbowl crater and the community of Makiki on the island of Oahu. The lauhala weaving wraps the ornament as a precious gift. The lei around the top greets all viewers with Aloha. We wanted to express our Aloha for the National Parks in Hawai’i for preserving the plants and animals in our beautiful Hawai’i Nei. Starmont Middle School – Iowa is know for it’s rich fertile soil and agriculture. When you look around around you will see fields of corn, soybeans, farms, churches, Goldfinches, oak trees and wild flowers, like the wild rose. The colors yellow and green are frequently used to represent Iowa. 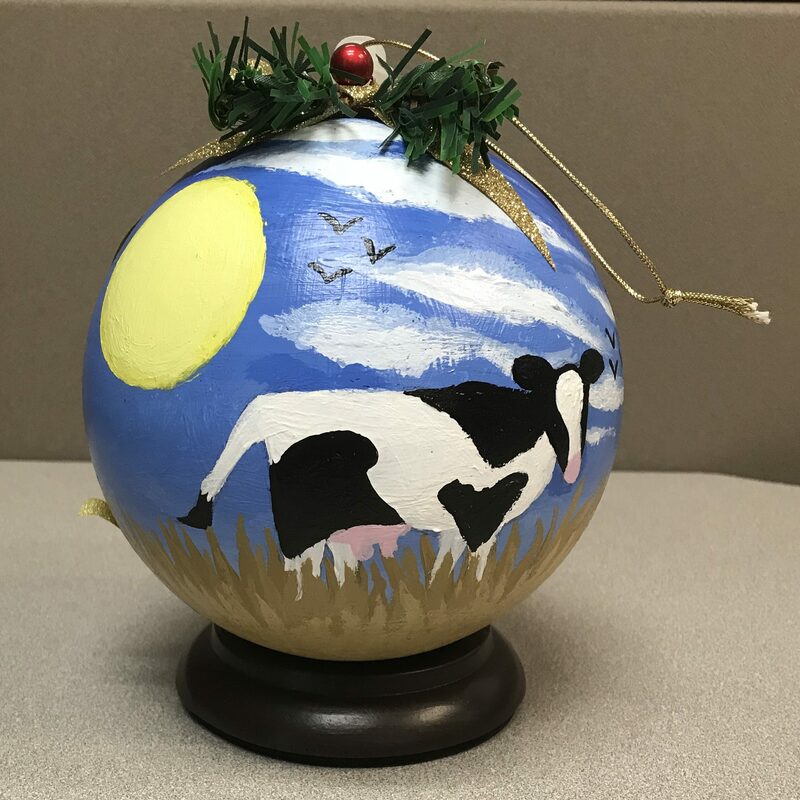 Starmont’s ornaments reflect what our students see everyday in Iowa. MACCRAY High School – MACCRAY High School (Maynard, Clara City and Raymond) is a consolidated public school district located in rural West Central Minnesota. Twenty-four MACCRAY students (grades 10th-12th) created ornaments that showcase various aspects of Minnesota including iconic state symbols (loons, walleyes, lady slippers, honeycrisp apples and monarch butterflies) and also various landscapes depicting the beauty of our state’s 10,000 lakes, winter scenes, farming, camping, waterfalls, lighthouses and landmarks. Students painted the images using acrylic paint with a sealer to add durability for the outdoor display. Our students are very honored to represent Minnesota at a national level. 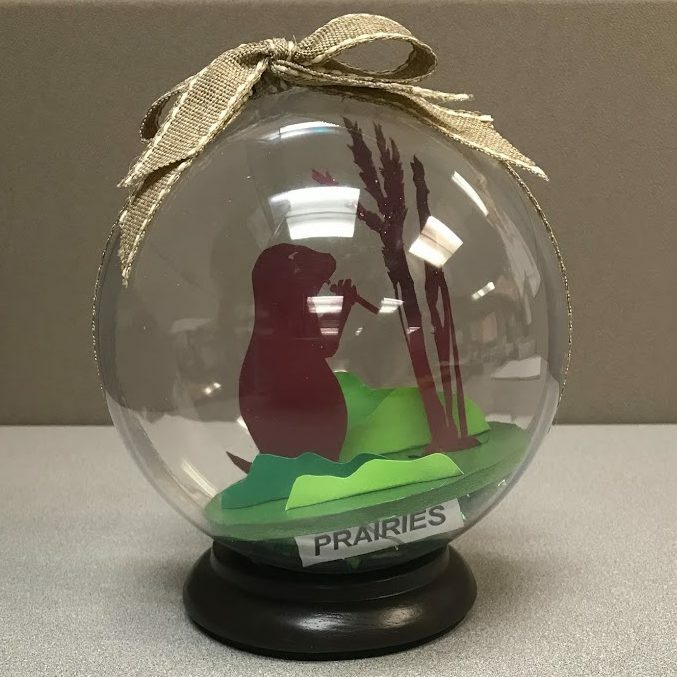 St. Mary’s School Bellevue – Each beautiful, hand-crafted ornament represents the diversity and variety found throughout the gem of the prairie, Nebraska. From the sand hill cranes, to grain-fed beef, our state offers something for everyone. 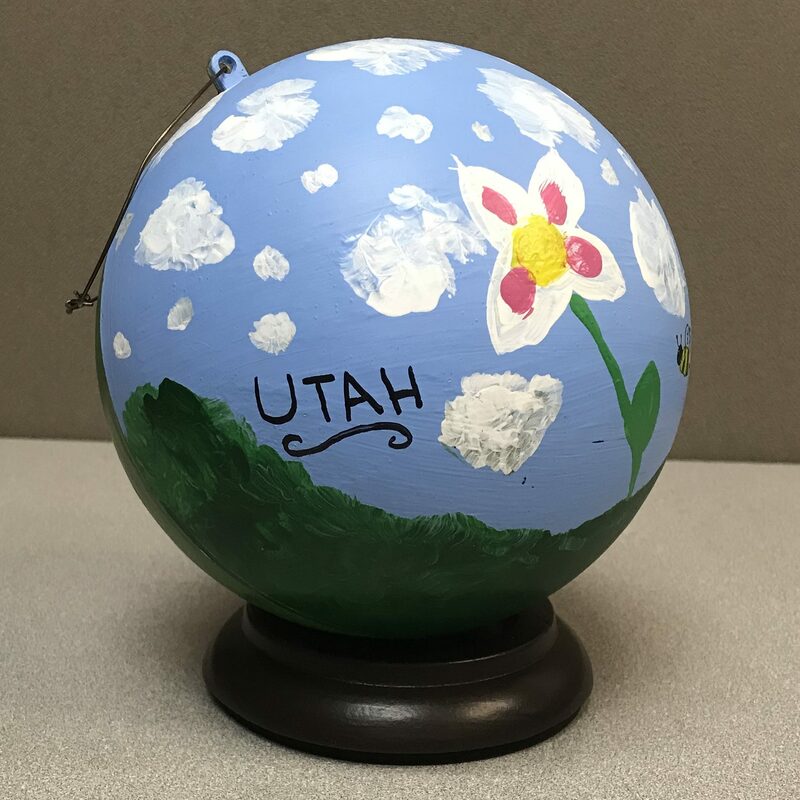 Our eighth grade students translated their love of their home state into ornamental works of art. 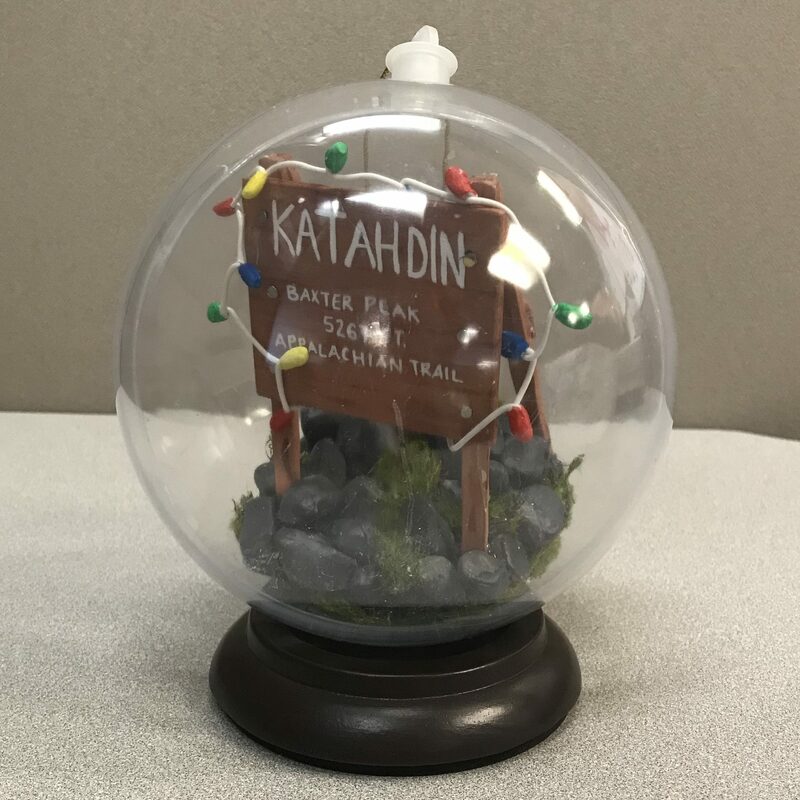 Each ornament is a testament to the place we call home. 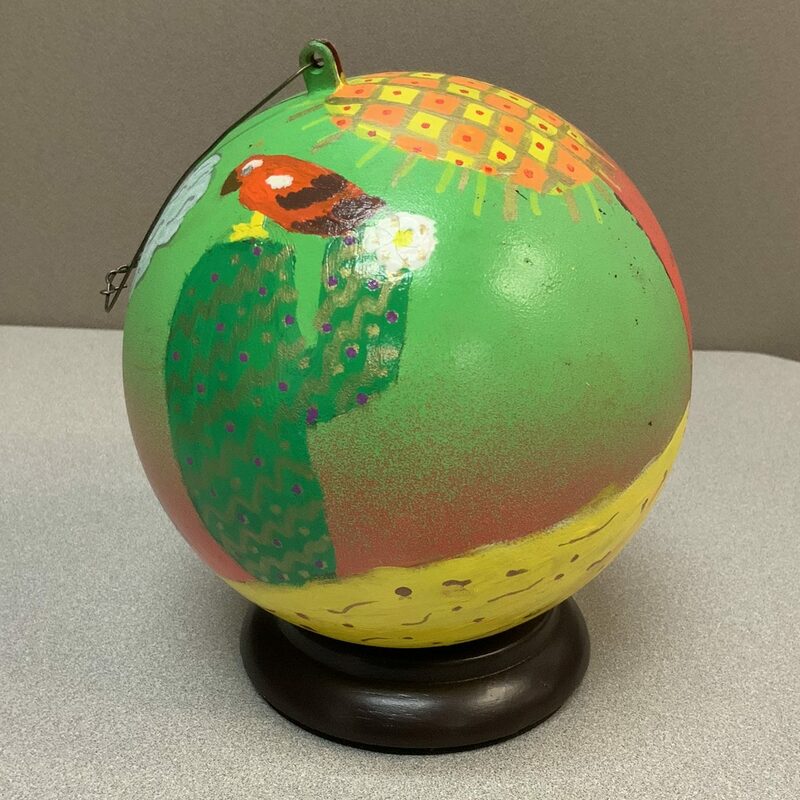 El Dorado Community School – These ornaments were created by 7th-grade art students in art teacher Roni Rohr’s class at El Dorado Community School in Santa Fe, New Mexico using a traditional tin art form called Repujado. Repujado is the art of punching and etching patterns, animals, flowers as well as milagro (miracle) symbols into tin. The students were inspired by the natural beauty of New Mexico, including the animals, plants, mountains and culture of the state. Nationally board-certified teacher Roni Rohr is a Golden Apple Excellence in Teaching Award winner, and is part of ArtWorks, a program of Partners in Education. 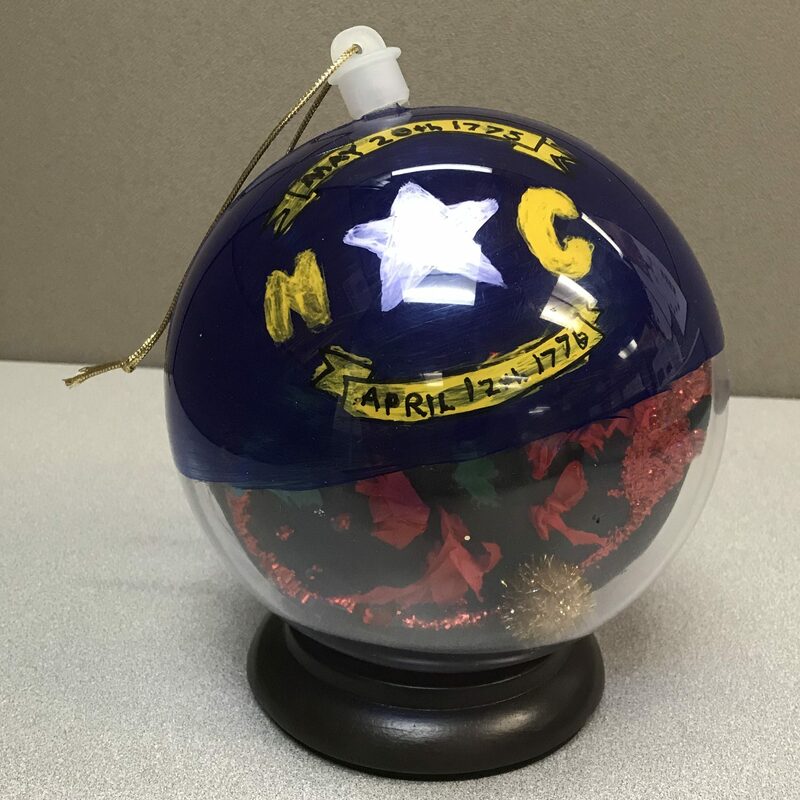 Mount Carmel School – The North Mariana Islands tree is decorated with ornaments created by Mount Carmel School’s 10th grade Art and Crafts students for the 2017 America Celebrates Display. 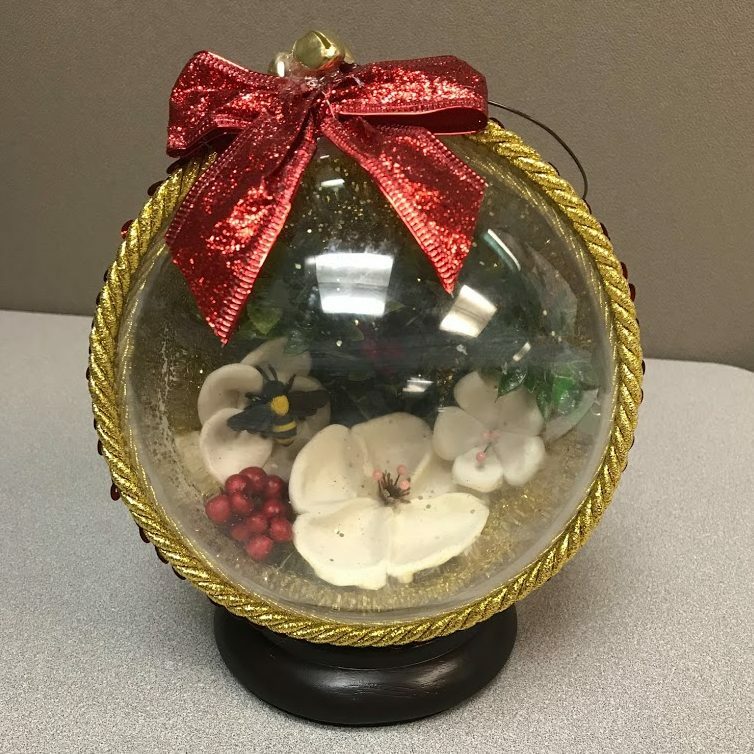 Saipan Southern High School was invited to create this year’s ornaments, but were affected by Super Typhoon Yutu this October. Middletown Area Middle School – Middletown Pennsylvania is situated in south central Pennsylvania, embedded in territory rich with historical context. The eighth grade students selected to create ornaments began by researching the subject, as they always do when tasked with the making of art. We brainstormed as a class about all the places that are markers of our state, such as Washington’s Crossing, Philadelphia, Pittsburgh and many more. They then challenged themselves to explore regions of Pennsylvania so they could exemplify the richness of our state’s natural resources, iconic places, and heritage. The result is a visual display of the diversity of Pennsylvania. 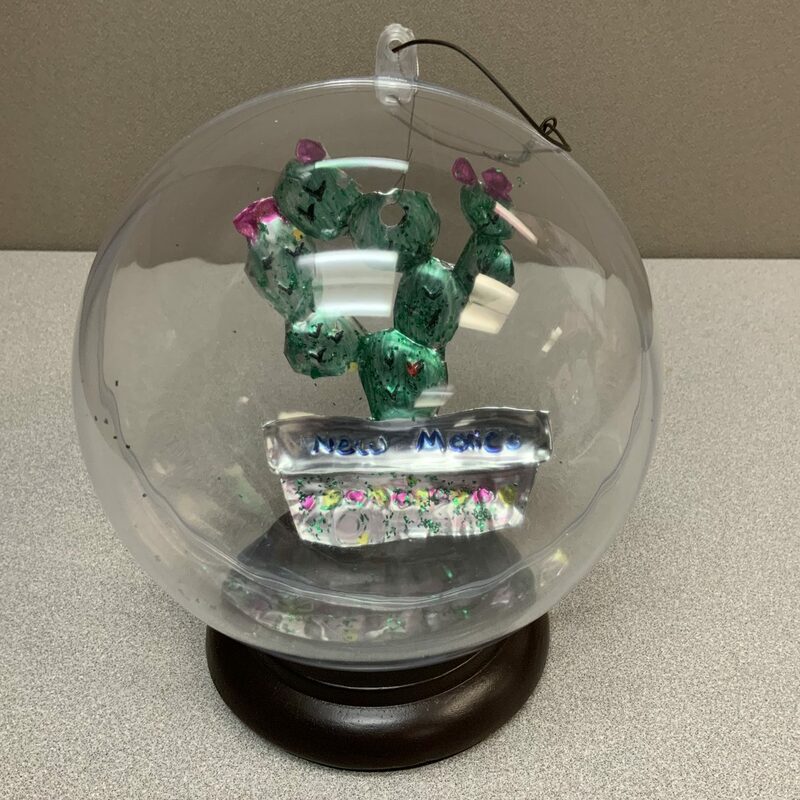 Roosevelt High School – Roosevelt High School in Sioux Falls, South Dakota created ornaments for our state’s tree for 2018. Art Club and painting students created colorful scenes of prairie dog, coyote, jack rabbit, pheasant, buffalo agriculture, waterfalls as well as city views of metropolitan Sioux Falls, the famous Corn Palace in Mitchell ,the picturesque prairie, and western South Dakota – Mount Rushmore and the Badlands. Native American (Dakota) master artist Oscar Howe is featured as well as geometric Lakota designs. Other images represented are the state flag, our ever-changing 4 seasons, and interpretations of the diversity of people in our state. Washington High School – Our school runs an after school Art Club program. It was with these students that we endeavored to create our ornaments. I left the process and techniques at the students’ discretion in order to encourage their creativity and the true spirit and joy of the season. Some of our club students found enjoyment in trying new materials and relished in the process of creation while others took painstaking measures to capture a specific idea. 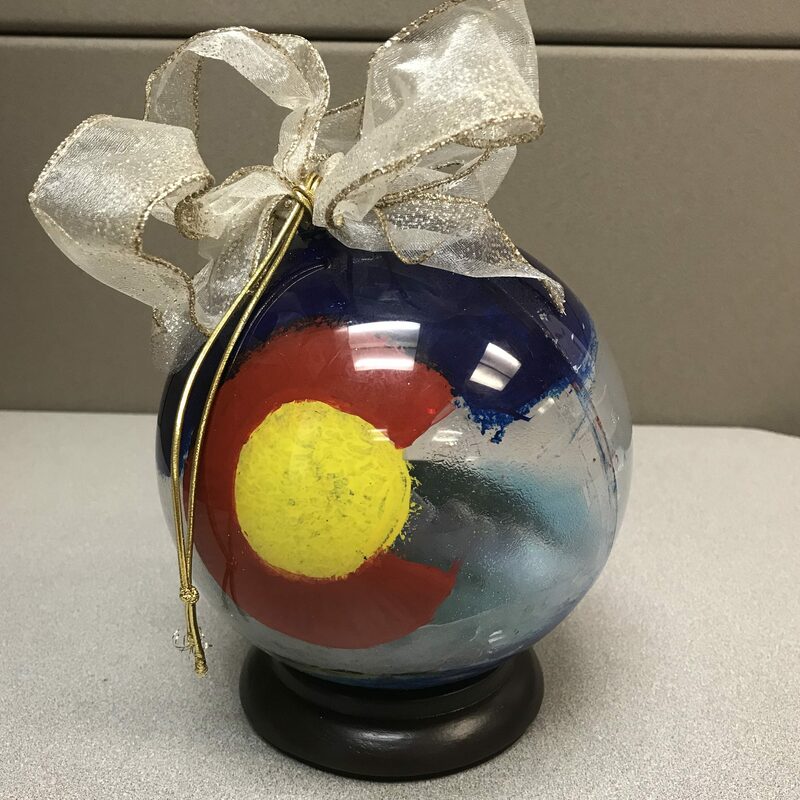 Chappelow K-8 Arts Magnet School – The ornaments that represent the State of Colorado were created by 32 middle school students from Chappelow K-8 Arts Magnet School in Greely/ Evans School District 6, under the direction of their Art Teacher, Alison Myers. Ornament designs were inspired by Colorado state symbols, the beautiful Colorado landscape, as well as personal experiences of students. The ornaments are adorned with a variety of artistic methods, including drawing, collage, painting, and sculpture. 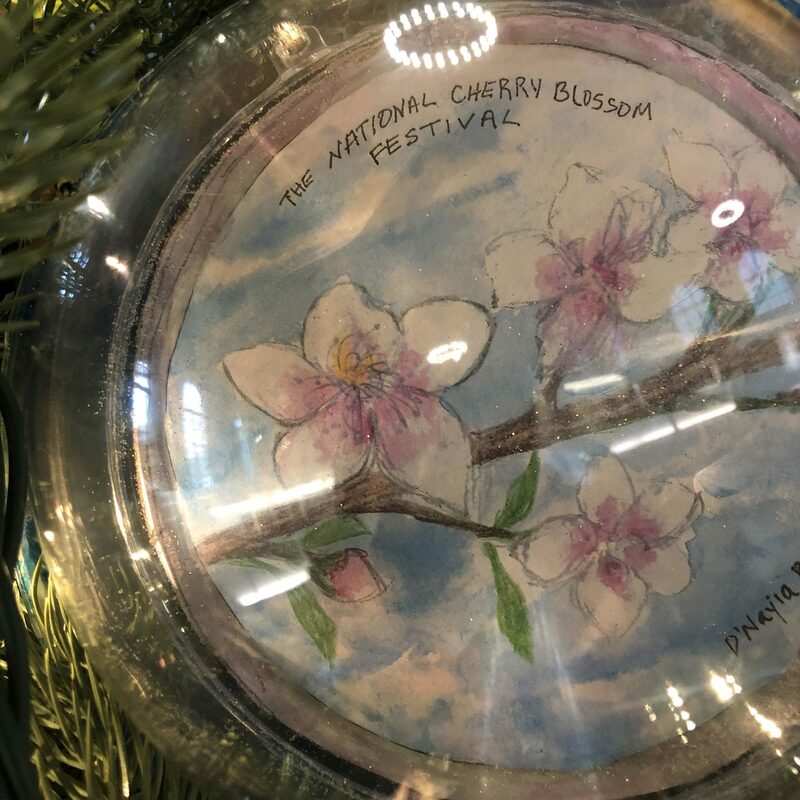 Each artist had complete agency over their artistic process and outcomes, and we are very honored to represent the State of Colorado in the 2018 National Christmas Tree Display. 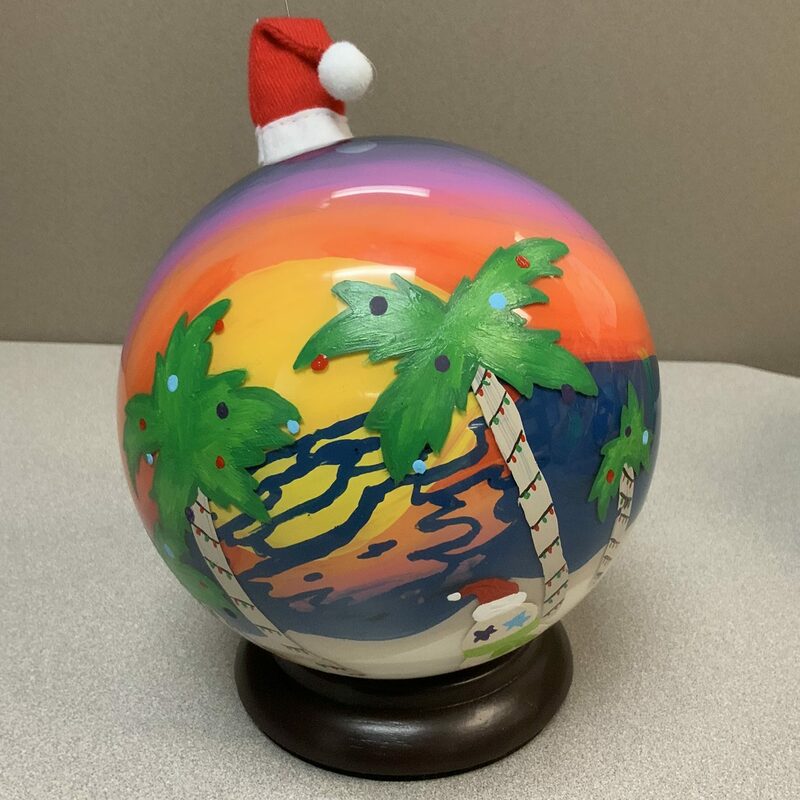 The Lecanto School of the Arts at Lecanto High School – The Freshmen Class of the Lecanto School of the Arts (LSA) collaboratively worked to create holiday ornaments for the America Celebrates National Christmas Tree Holiday Display. LSA is a visual arts magnet program in rural Citrus County, Florida. Citrus County is blessed with state parks, forests, rivers, lakes and the Gulf of Mexico. With so much natural beauty, students chose the theme of nature for our ornaments. 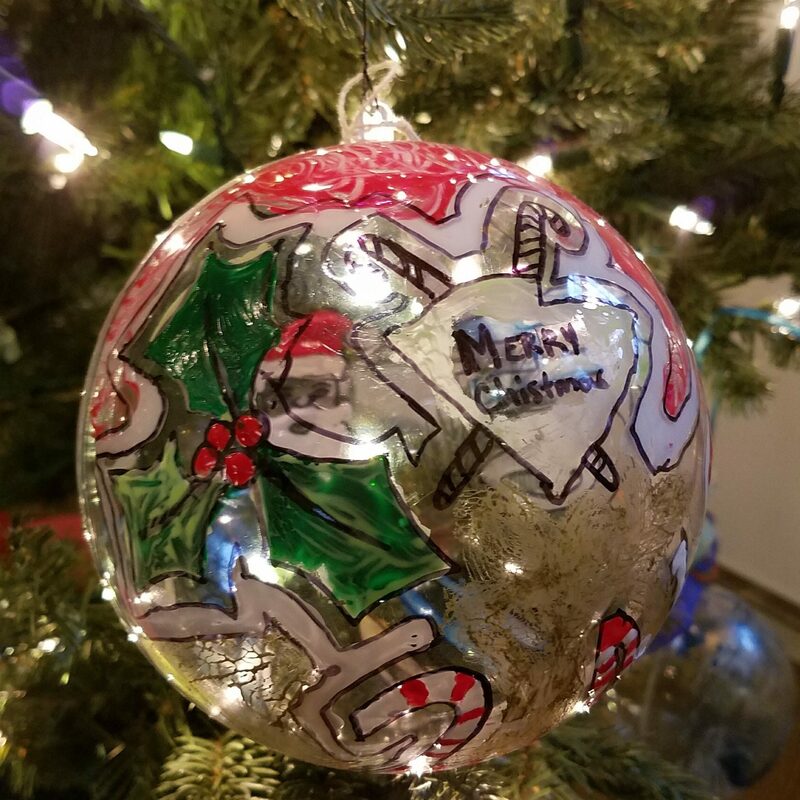 The students used exterior house paint, polymer clay, and found objects to create their unique ornaments. Each ornament was then topped with a Santa Hat for the holiday display. Central Academy – “Esto Perpetua,” – “Let it be Perpetual” is our state motto. Central Academy students painted scenes of the rolling palouse in Northern Idaho to the Perine Bridge in Twin Falls. Students celebrated history and traditions of Idahoans through state symbols such as the Appaloosa, Mountain Blue Bird, Cutthroat trout, Syringa and Monarch Butterfly. First nations are recognized by name and flags. Our outdoor lifestyle is depicted by mountain scenery, animals, biking, kayaking, ballooning, base jumping and camping. Basque culture and pioneer spirit flourish in the Gem State, Let it be Perpetual. 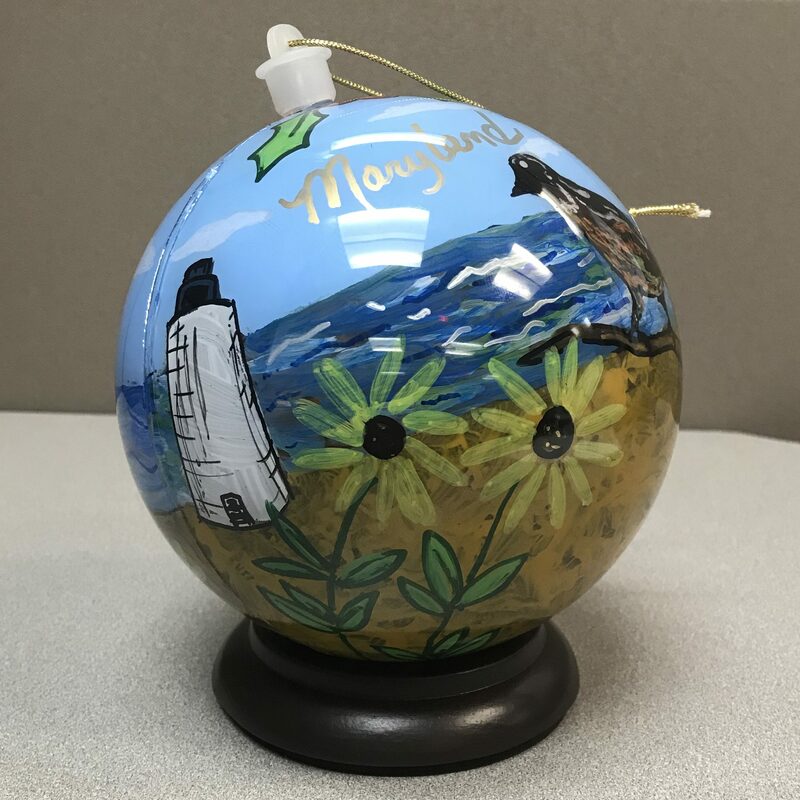 Leonardtown High School – Visual Arts I students from Leonardtown High School had the amazing opportunity to paint these ornaments. The students chose symbols and landmarks that represent our state of Maryland. The wide range of the symbols and landmarks show how interesting and diverse our beautiful state is. The students drew sketches for their ornaments and then painted them using a reverse paint process from the inside of the ornament. The results are wonderful and show the various abilities of the students in the class. Forest Hill High School – When the Advanced Placement Studio Art classes at Forest Hill HS was asked to create holiday decorations for the America Celebrates display, Ms. Moore’s students were inspired to create ornaments that represented the culture of Mississippi and why we are called “The Hospitality State”, by featuring her writers, artists, musicians, local landmarks and symbols, and the spirit of the people who live there. 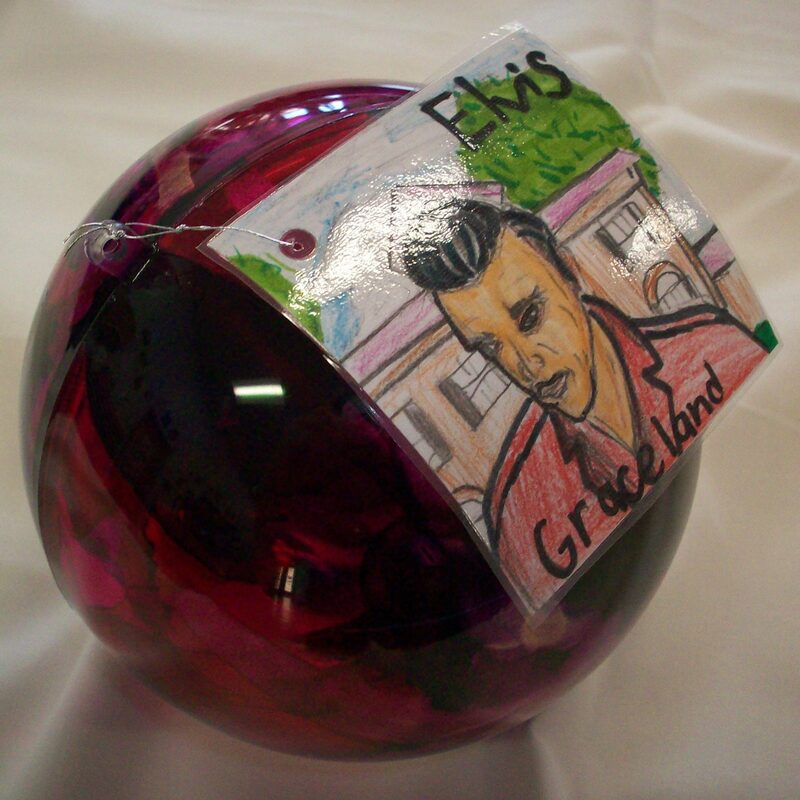 On the ornaments you will see the state surrounded by a ring of holly with a Mississippi image, such as William Faulkner, Elvis, artist Walter Anderson, the catfish, Delta Blues crossroads, Mississippi Riverboats, BB King, Kermit the Frog, plantation homes like Longwood, and many more. 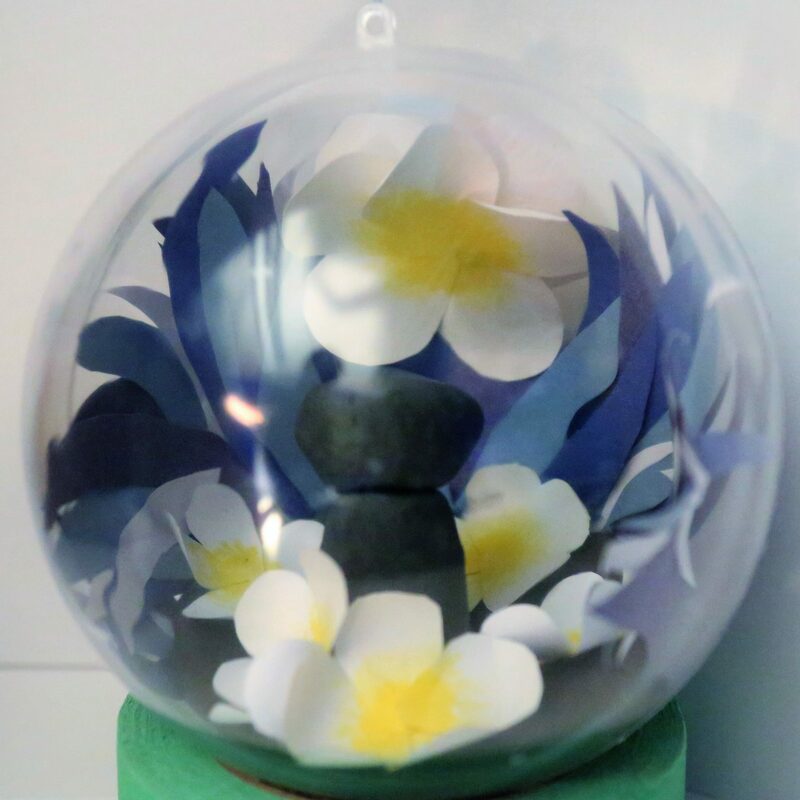 The student’s used a mixture of painting and collage techniques to complete these ornaments dynamic designs. Gerlach K-12 – The Gerlach K-12 School is a rural school in northern Nevada serving students of all ages. 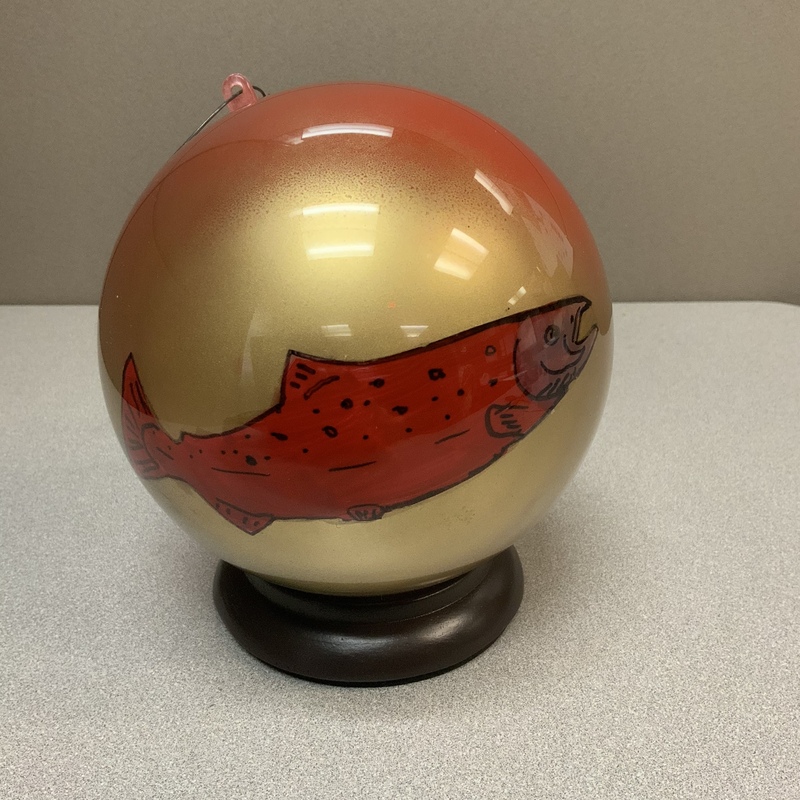 Our ornaments represent many different parts of Nevada including the state fish, fossil, gemstones, native animals and plants, and various industries such as mining and gaming. 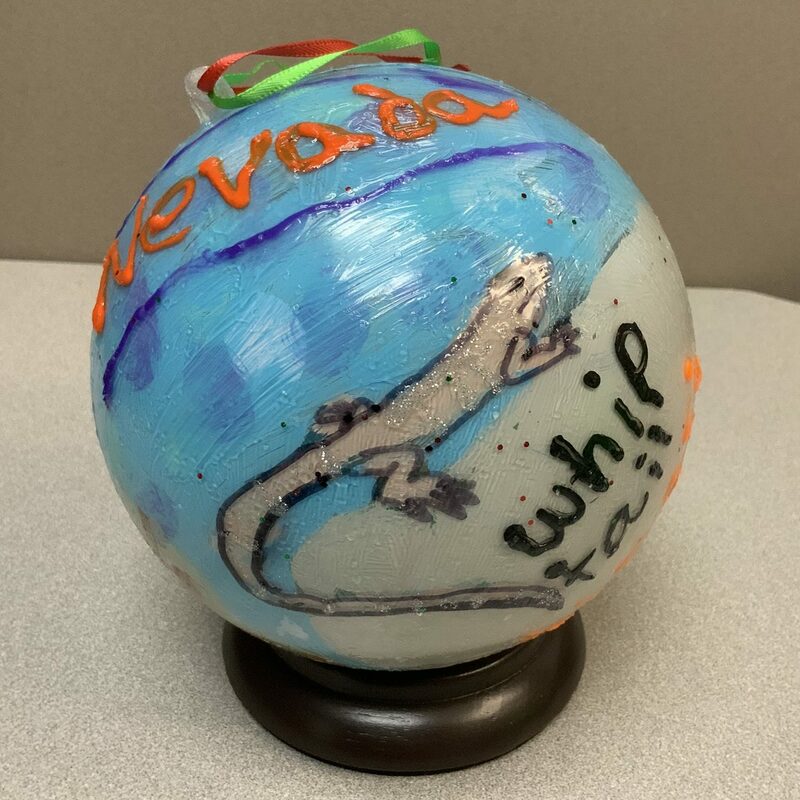 As Gerlach is on the edge of the Black Rock Desert, many of our ornaments also feature interesting facts about the ways in which these National Public Lands are enjoyed and treasured by people locally and visitors from around the world. 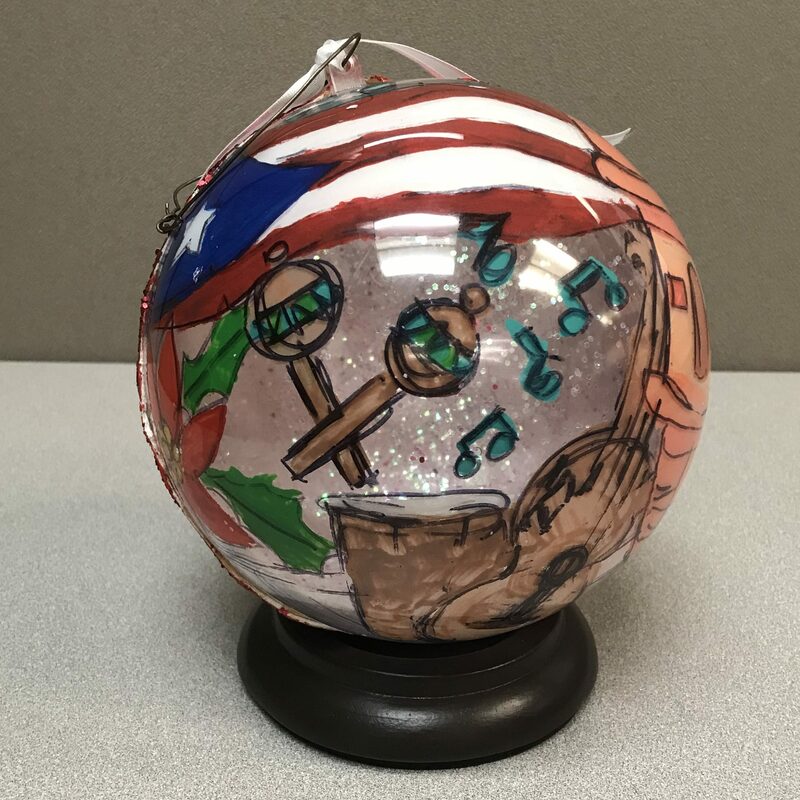 Students worked collaboratively to create their ornaments using acrylic and puff paints, transparencies, paint markers, and glitter. Dryden Senior High School – Dryden is a rural community located in the Finger Lakes Region of New York State. Dryden Senior High School Junior and Senior students enrolled in A.P. 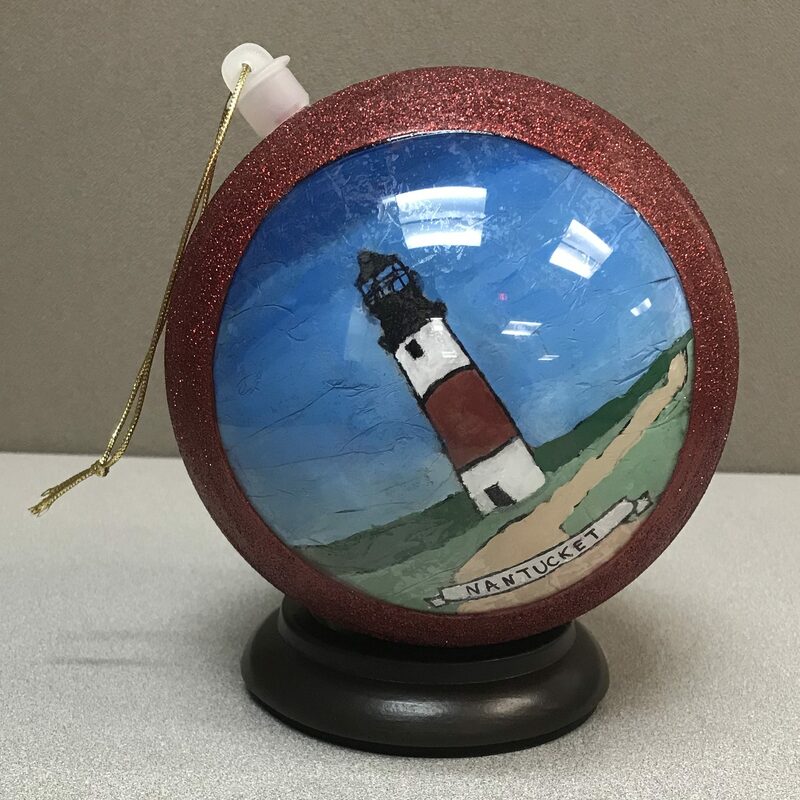 Studio Art 2-D & 3-D, Graphic Design ART117 and Advanced Darkroom Photography classes represented New York State by decorating the holiday ornaments. Eleven students worked with a range of materials as they selected a variety of regions across the state. Western New York with waterfalls, the Finger Lakes region with gorges and wineries, the Capital Region, the Adirondacks, and New York City have been represented by key landmarks including our state bird and animal. 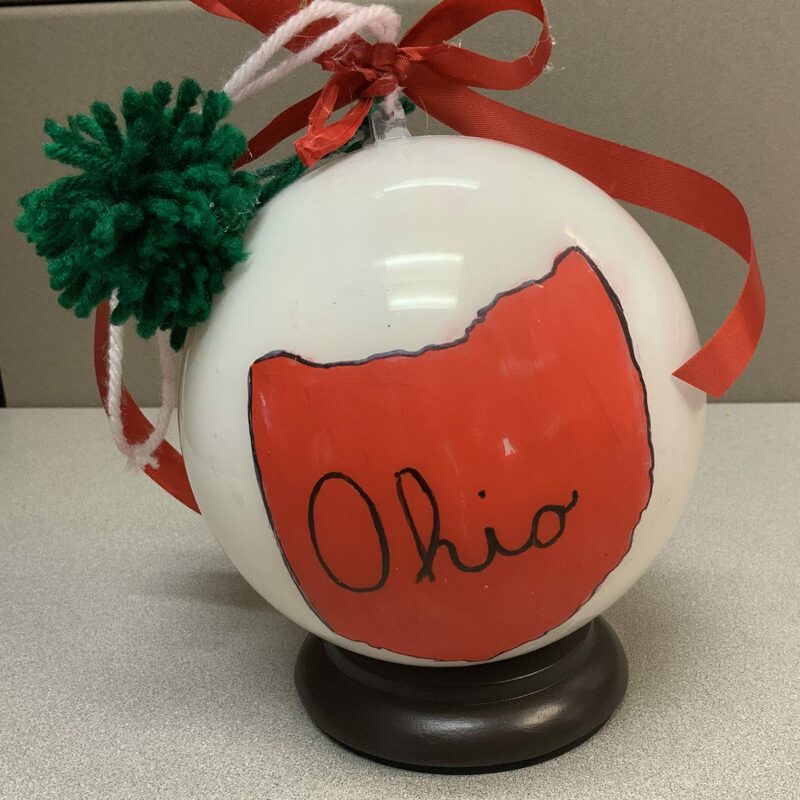 Milford Junior High School – Our Ohio-themed ornaments were created by an art class of 8th graders in southwest Ohio. The students in the class are very dedicated to art and have a passion for their work. They chose to use our state flower, tree, bird, insect and state shape to adorn their ornaments. 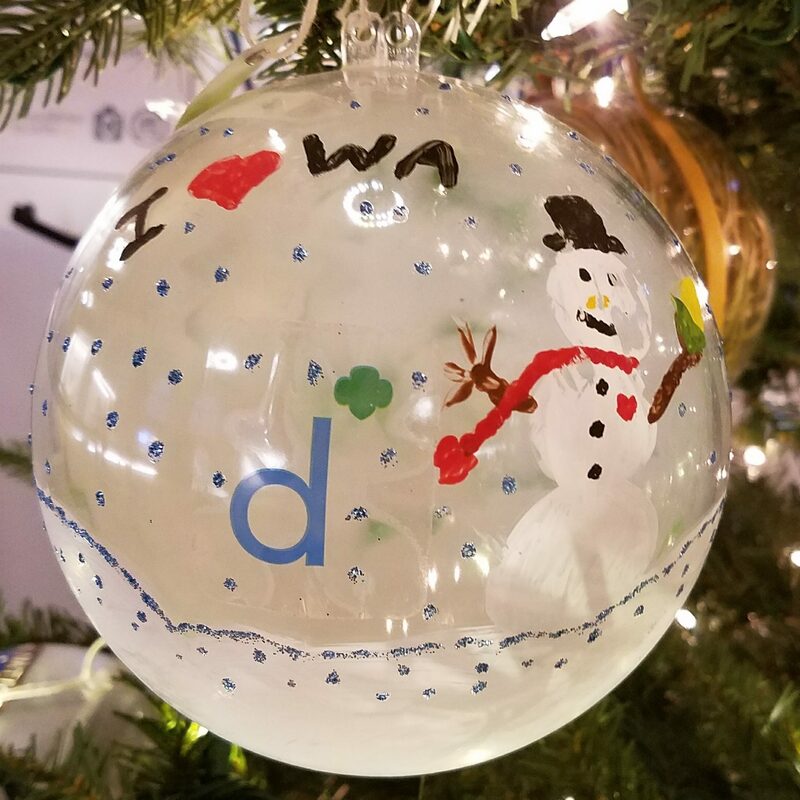 They had fun planning out and painting the ornaments as well as having a district photographer come and feature them in the district newsletter. Fairview Middle School – The Art Club enjoyed drawing emblems that represent our state from east to west as well as state flower, bird, tree, insect and notable persons. Students learned so much about our state’s history through this project as well! The medium we used was alcohol inks decorated on the inside. These fast-drying inks were blended and swirled to obtain jewel-tones and then finished with a flash of metallic gold or silver. The hope is that daylight will be caught through the transparency of the inks and at night if the trees are lit, this will shine through also. 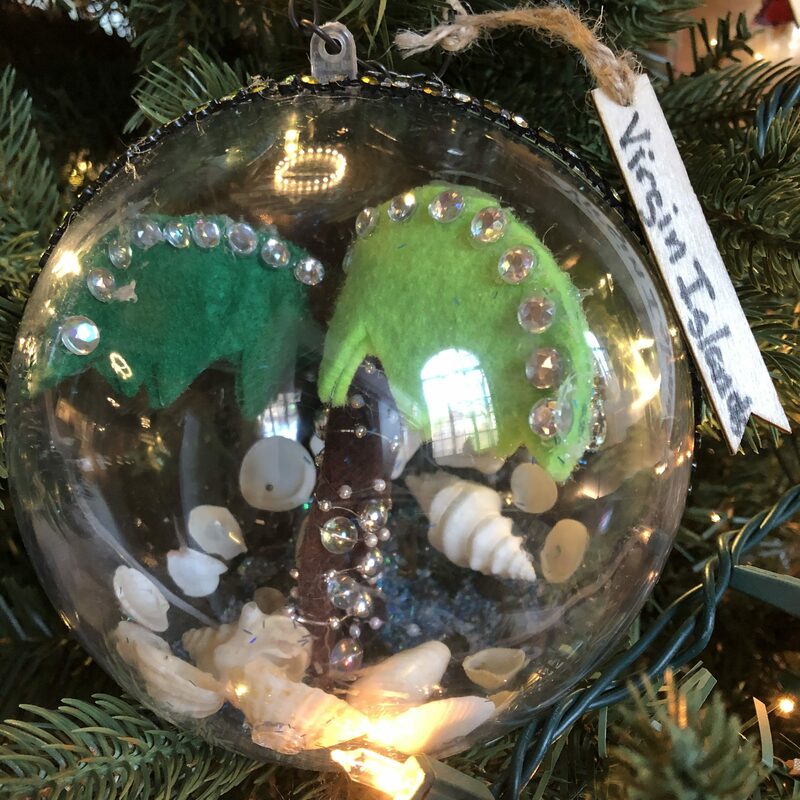 St. Croix Educational Complex – The Ivanna Eudora Kean High School students envisioned “Christmas with a Caribbean Flare” as they highlighted local and global expressions of Virgin Islands’ culture within their designs. 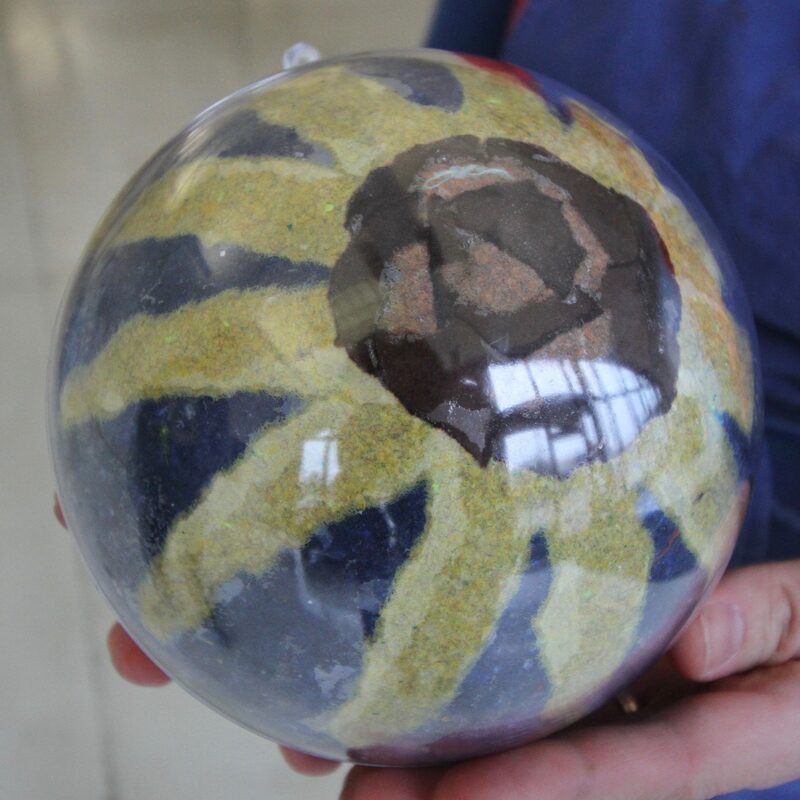 The students found innovative ways to create ornaments with culture and sustainability in mind as they repurposed various household items to create the stunning decorations. DeLong Middle School – DeLong Middle School students from 6th, 7th and 8th grade created their translucent ornaments using tissue paper and markers. Inspiration for the art process of these ornaments came from a piece of art from South Africa. It was an upcycled plastic container covered in beautiful decorated tissue paper. It had the quality perfect for their ornaments. They wanted their work to appear it though it was glowing, so the light needed to travel though the ornament. Our students’ designs include our state bird, flower, fish, fruit, tree, grain, wildlife, beverage, slogan, animal, and insect drawn within one of our four seasons. Isaac Middle School – The Arizona ornaments were created by the Isaac Middle School Afterschool Art and Mural Club. We wanted to celebrate the flora, fauna and landscape of Arizona along with the diverse heritages of the people of our state and school. Students worked collectively to identify what should be celebrated and then decorated the ornaments collaboratively using spray paint and paint markers to represent the blossoming street art scene in Phoenix. Carmen Arace Intermediate School – The Carmen Arace Intermediate School 6th graders of Bloomfield, Connecticut, wanted to highlight ways that Connecticut ‘connects’ with America. 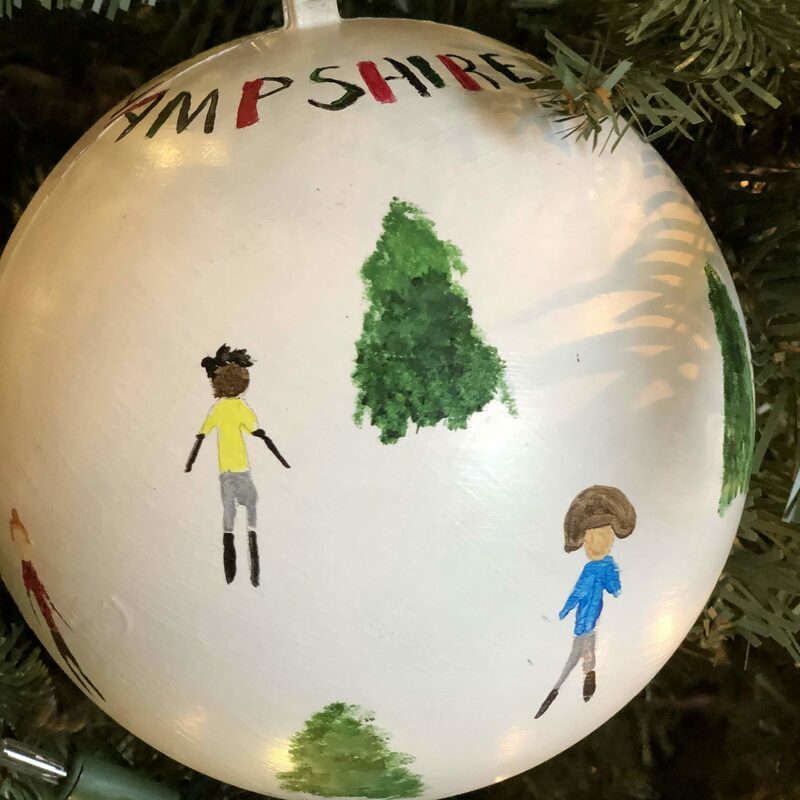 Each ornament represents a person, place, or thing that is indicative of Connecticut. From inventions, unique experiences, manufacturing, to natural wonders, Connecticut is a truly special state. Surrounding the outside of the ornaments are multicultural hands that represent our CONNECTion to each other and to our fellow states and territories. 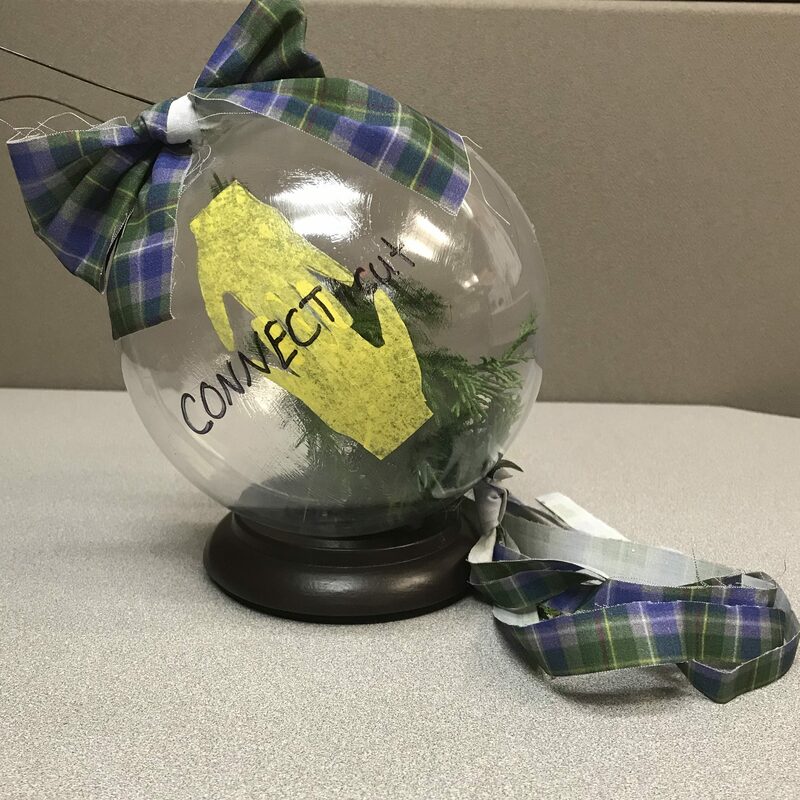 Topping off the ornaments is a piece of the official Connecticut tartan whose colors represent the Long Island Sound (blue), forestry (green), granite (grey), snow (white), garnet (red) and foliage (yellow). 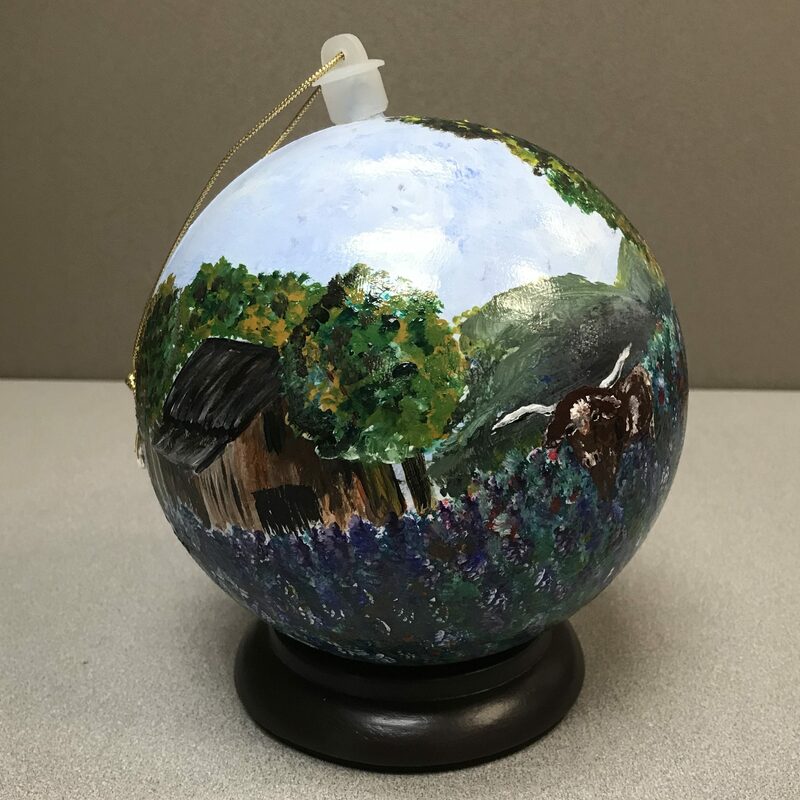 Riverwood High School – The ornaments from Georgia were made by members & sponsors of the National Art Honor Society from Riverwood International Charter School in Sandy Springs, GA. To represent all the unique aspects from Georgia, we each chose an area of interest. We also used our own unique artistic talents to recreate our ornaments. 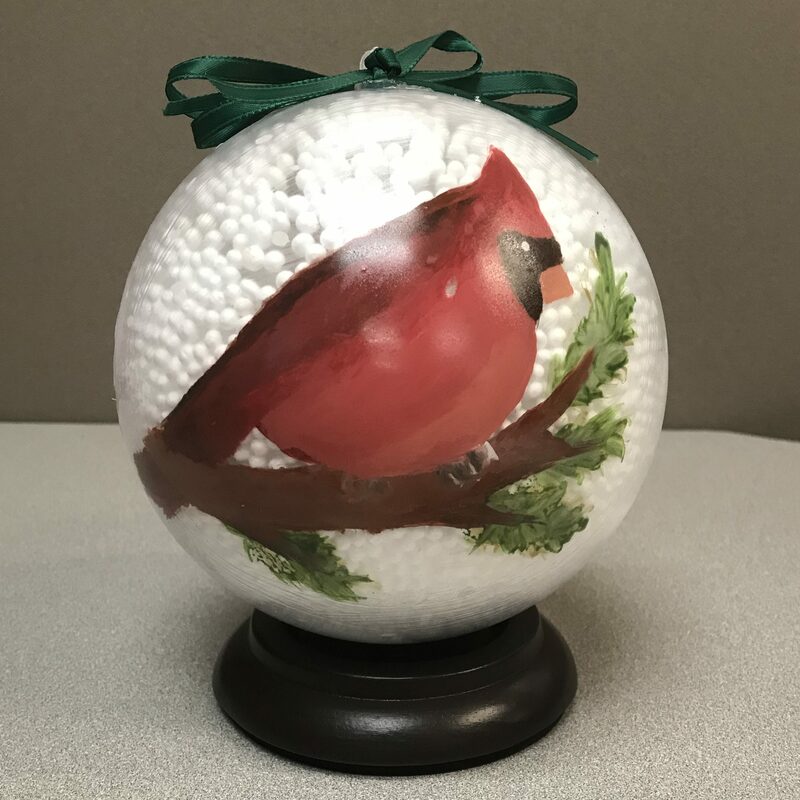 Some of our ornaments contain sculptures, others are painted, while others have mixed media. Each ornament represents us as artists and a part of Georgia. Dwight Township High School – Dwight Township High School is located in rural Illinois with a great community of creative and helpful people. Over 27 high school art students helped create the ornament designs and were very excited to showcase their talents. 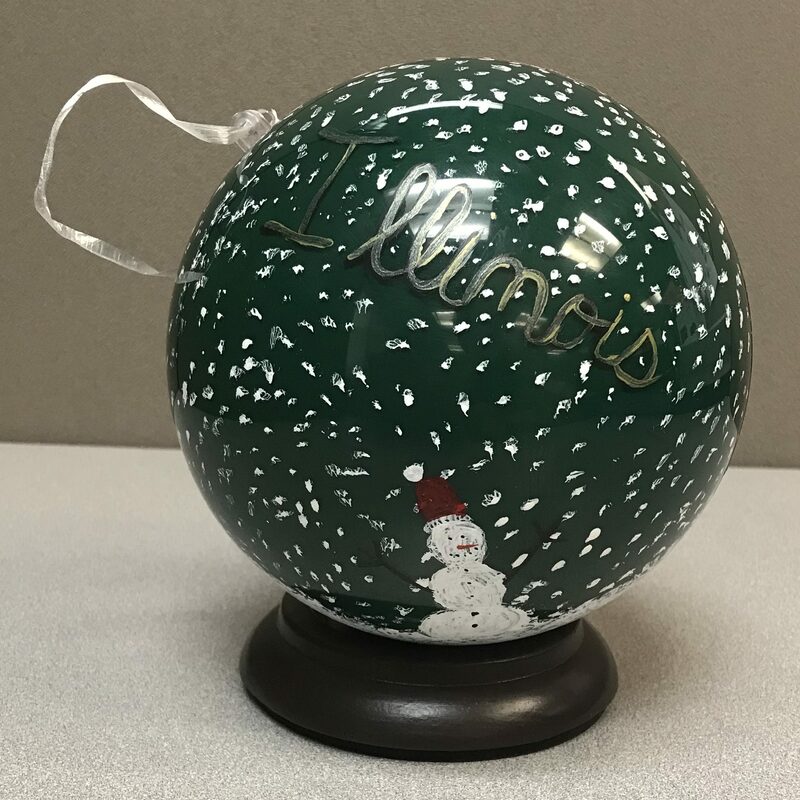 Students created using inspiration from iconic imagery of Illinois with prominent red and green with a hint of gold on the ornaments. Each student added their own creative spin to their ornament and completed the artworks in less than a week. St Charles School – Our group of twelve students in grades 6-8 honor Massachusetts with their depictions of iconic landmarks and places. Students researched their locations, designed an image, and painted it on tissue paper. 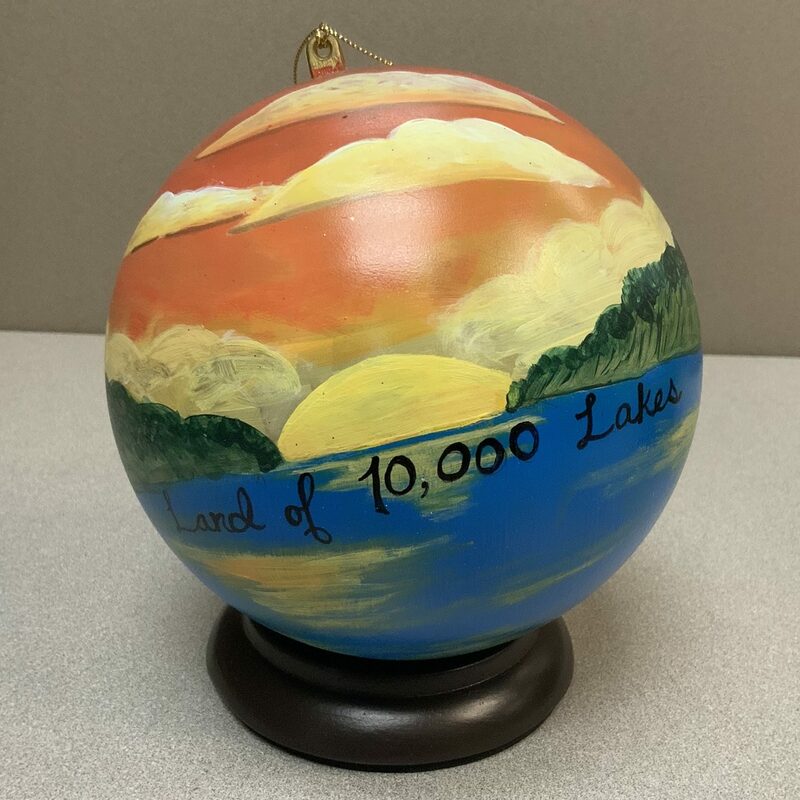 They then decoupaged their artwork onto the inside of the ornament. Their ornaments represent historic buildings, such as Faneuil Hall, the Old North Church, and Plimoth Plantation; famous universities such as Harvard and MIT; architectural achievements and memorials such as the Bunker Hill Monument and the Dr. Seuss Memorial; and recreational sites such as the Minuteman National Historic Park, the Boston Public Garden, and, of course, Fenway Park. Hazelwood West Middle School – It has been a privilege to represent Missouri! While we started with the creative process, I instilled the idea of “Paying it Forward” by honoring our veterans as a service project to our great country. My students and I collaborated as a team to research our state’s hisotry. My mission was to tell a story with symbols while representing our school melting pot where we have 12 languages and 14 countries learning together. It was exciting to involve over 50 students, working in shifts and relating to the project as a “real job.” We worked as professional artists using a multimedia, Cross-Curricular and multi-cultural approach. We decided to join the White Hawthorne Blossom and Honeybee with a gold, green and red color scheme. We developed a deeper love for our country and gained interesting facts about the Show-Me-State, home of the tallest manmade monument and Gateway to the West! We respectfully thank you for this amazing experience! Contoocook Valley Regional High School – ConVal has a strong and active art club. We had 24 of our most active students take the ornaments and the guidelines and run with it. This is what they came up with. Needham B. Broughton High School – Broughton H.S. is a Global studies school in Raleigh, North Carolina. This is the second year that the advanced art class and self contained special education classes worked together to create art. All students collaborated, making the center portion. The art classes adorned the outside, creating multidimensional ornaments. This project was a great opportunity for the art students to share their skills, be inclusive, and to help facilitate other student’s creativeness. 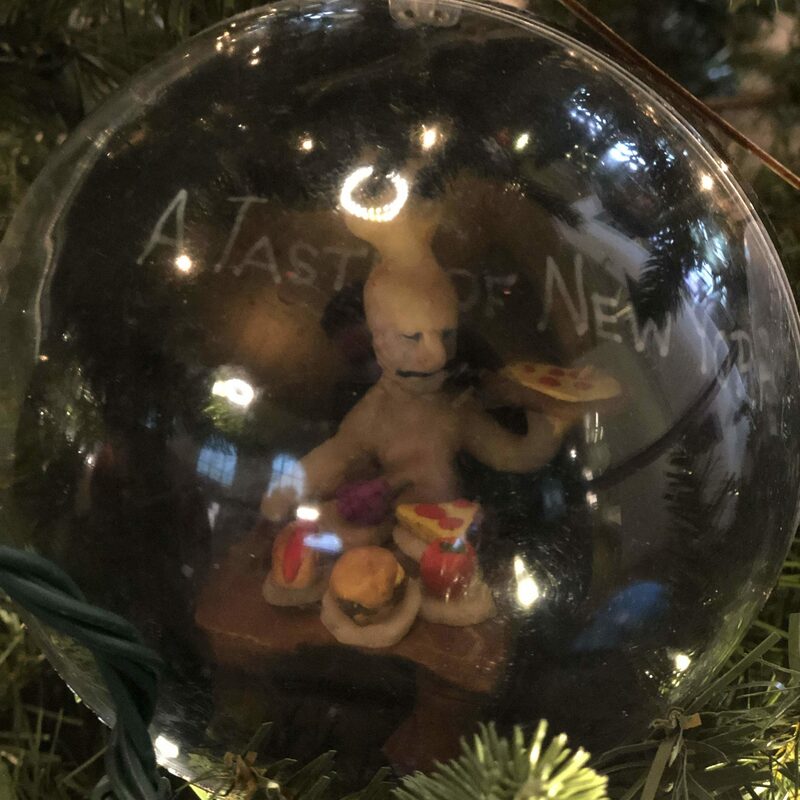 We hope that all who view these ornaments will realize that art is for all. It is not always about skill. It is about enjoyment and creative expression. 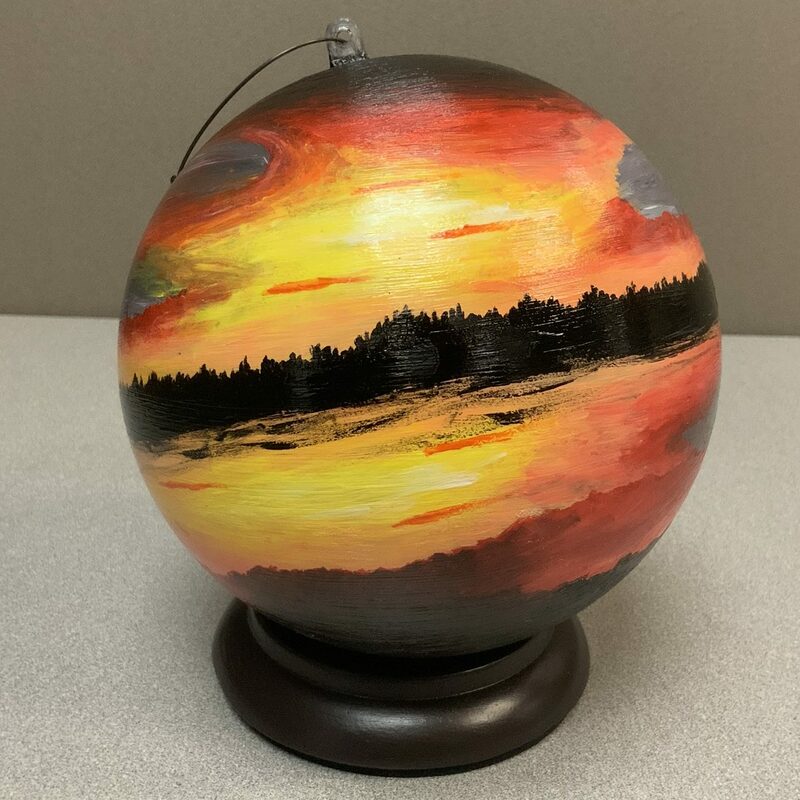 Middle School of Piedmont – Our MSP Art Club consists of students with diverse abilities, talents and personalities, who share one common interest, bringing ideas to life. When I introduced the ornament project to them you could see and feel their creative imaginations going to work. 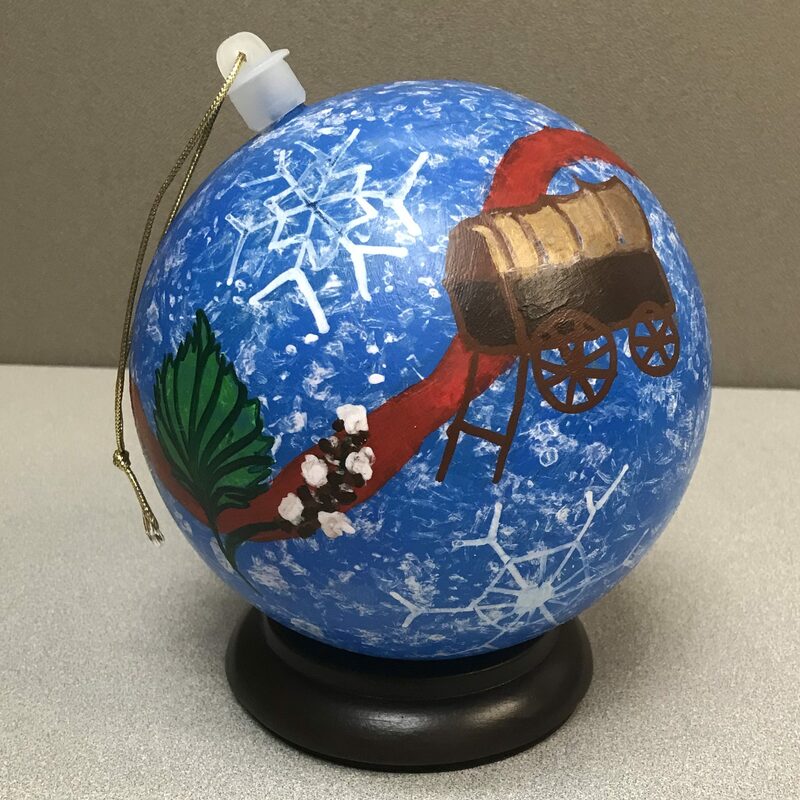 While staying focused on Oklahoma state symbols and images, the students used multiple mediums including paint, clay, wool, miniatures, beads, feathers and rocks to form two and three-dimensional visual imagery inside and outside the round ornament format. 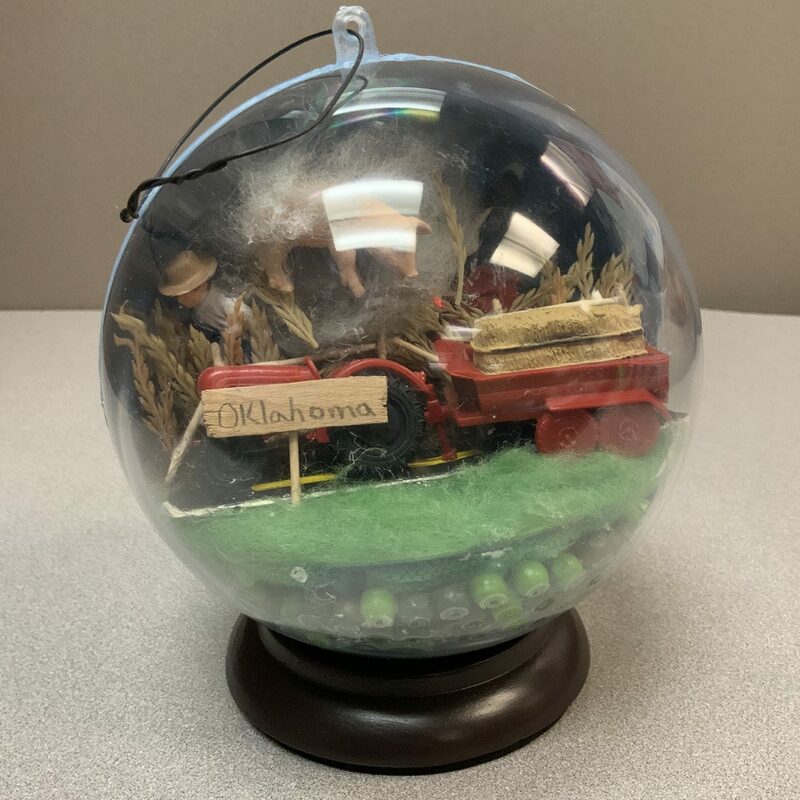 The students used, a buffalo, tornado, scissortail, mistletoe, redbud, state shield, honeybee, Oklahoma rose, wheat, rose rock and Oklahoma port soil. 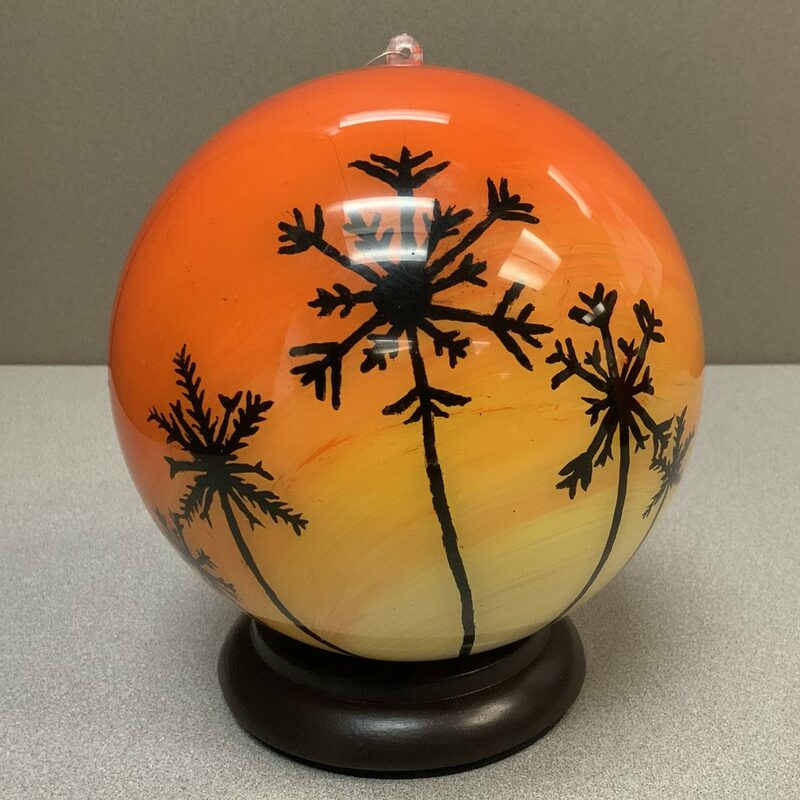 Knippa School, Knippa ISD – Students and staff within the Knippa Collegiate school had no trouble seeking inspiration for their ornament designs. What is there not to be inspired by in the great state of Texas? From the famed Armadillo to the beautiful coastal birds these ornaments showcase all things Texas. They vary in style from whimsical scenes of butterflies and bluebonnets to realistic sculptures of rattlesnakes and cacti. Students also drew inspiration from our proud history of Independence and our cultural ties within the Hispanic community. The students selected were from Mrs. Brauchle’s Duel credit Art Appreciation class and her Senior Internship class. Governor’s School for the Arts – The Governor’s School for the Arts is a center for innovation that develops excellence, nurtures creativity, inspires artistic vision and builds communities with a passion for the arts. Students in the Visual Arts department were excited to be a part of this public art project and display their creative talents on a national level. 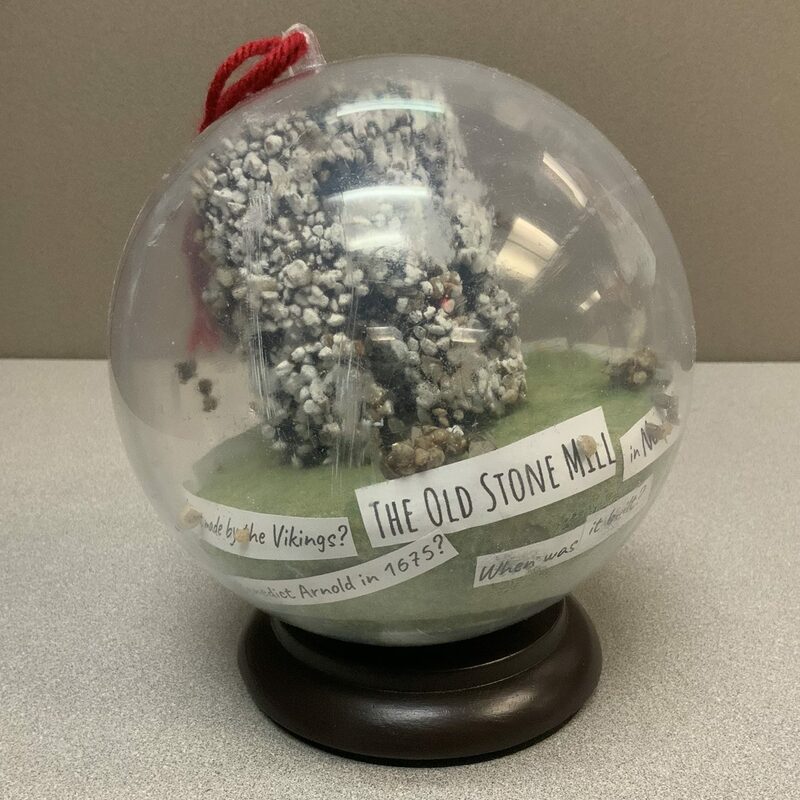 Each ornament our students created is an original work of art and reflects the students’ love of our school and the state of Virginia. Using landscapes, landmarks, and state symbology the artists explored a variety of opportunities for visual expression. 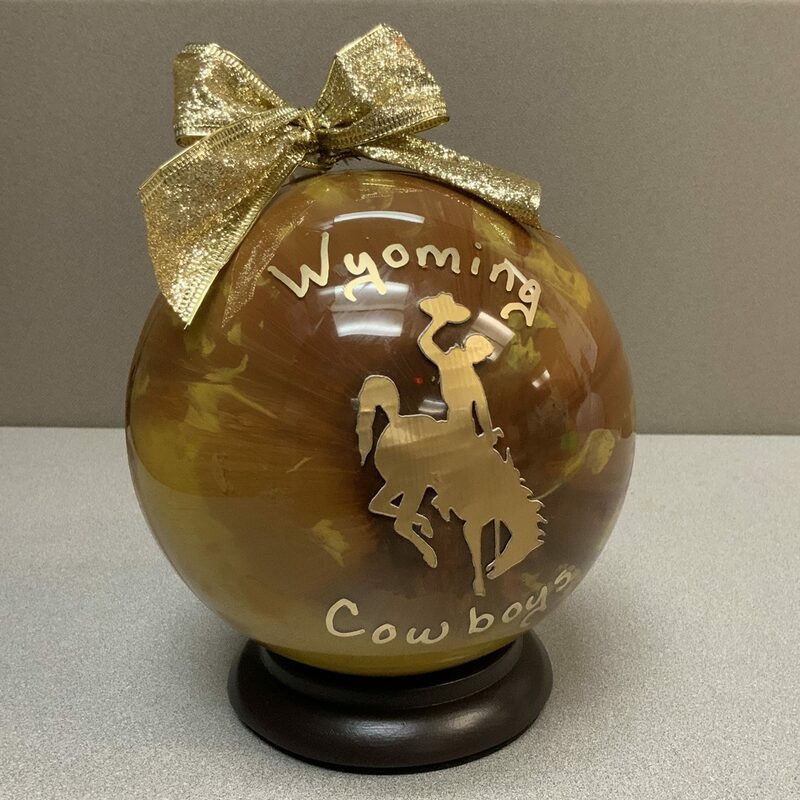 Lingle-Fort Laramie High School – Our middle and high school students chose to represent our state with University of Wyoming colors and paint. We were helped by the Vocational Technology class creating Cowboy stickers for us with duct tape and a laser cutter. Ingenuity being a one of Wyoming’s many wonderful traits!